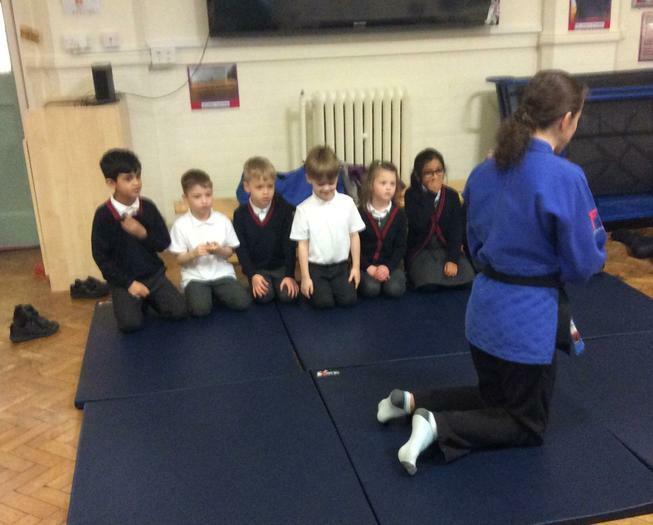 Photos relating to specific classes can be found at the bottom of each Class Page. 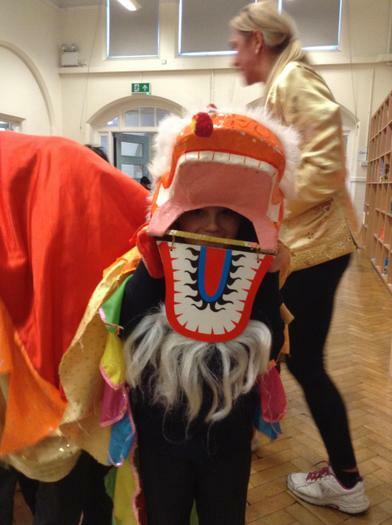 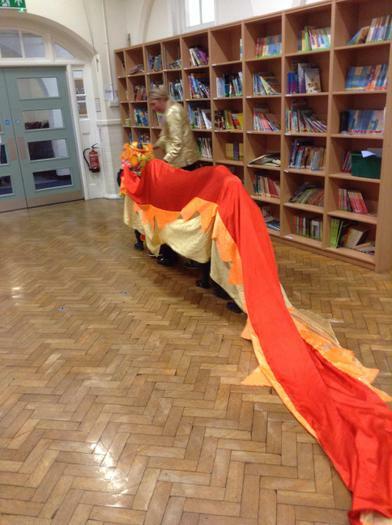 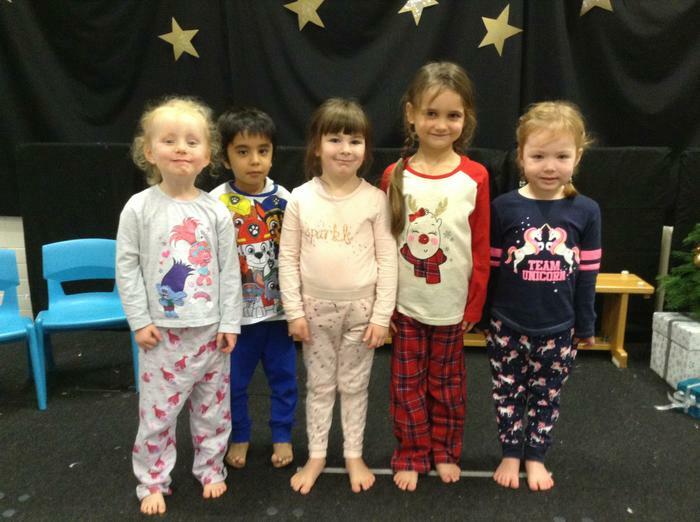 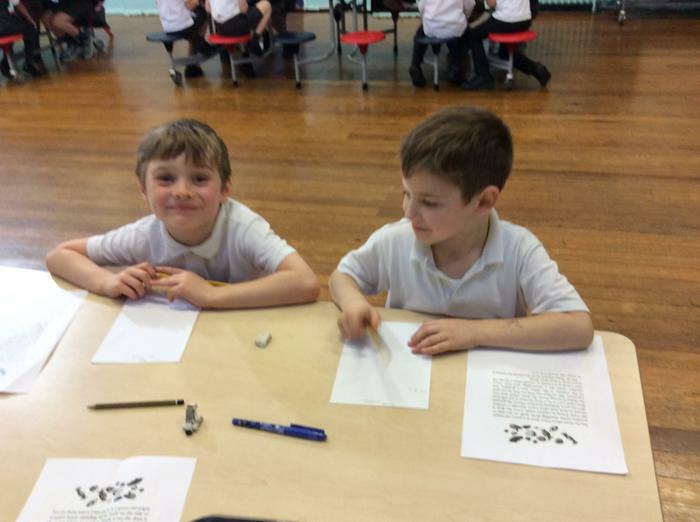 Below are a selection of photos from recent activities. 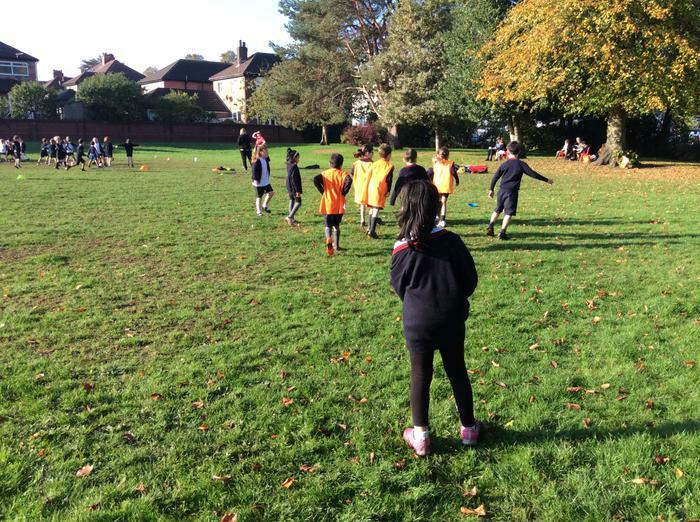 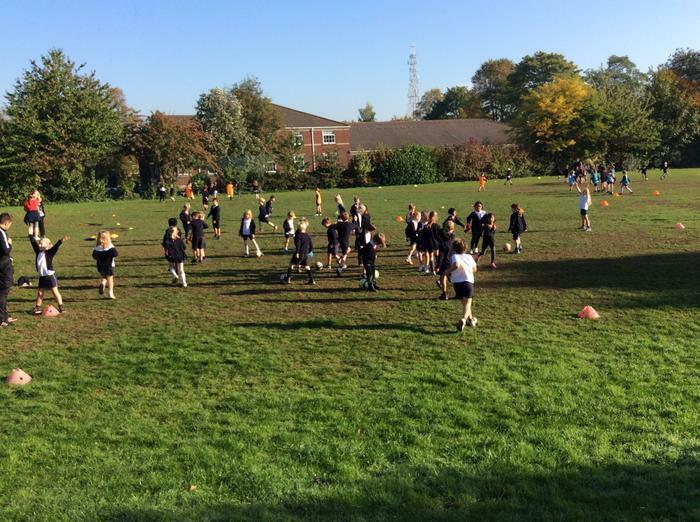 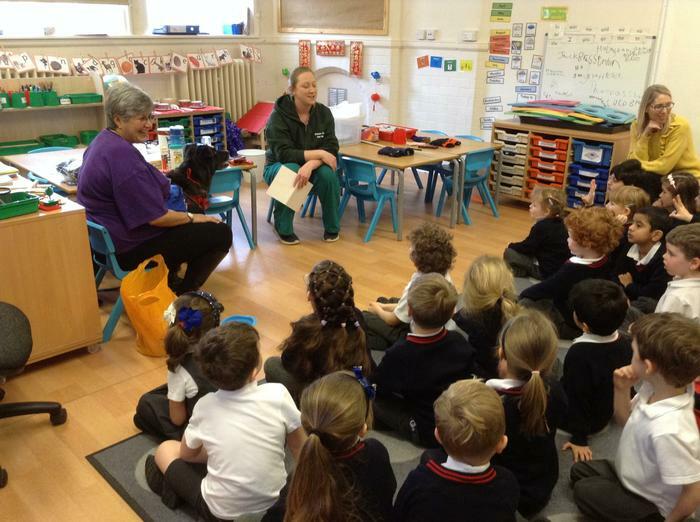 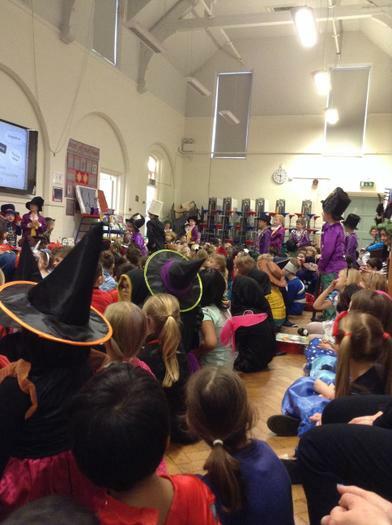 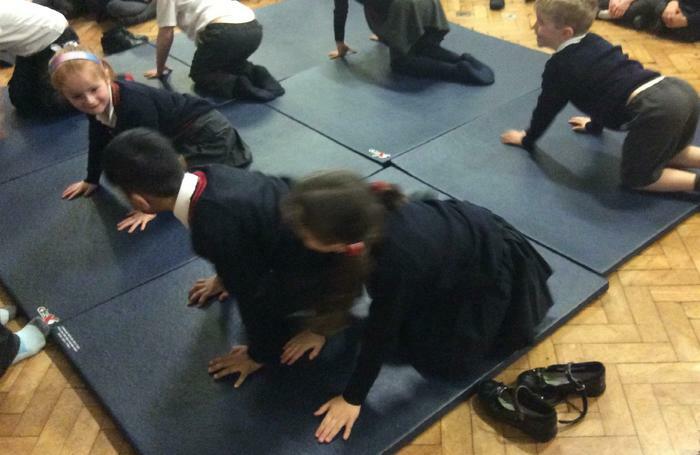 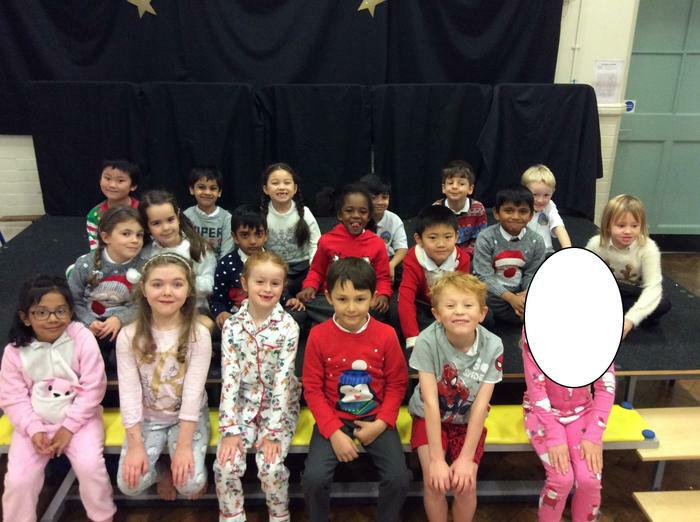 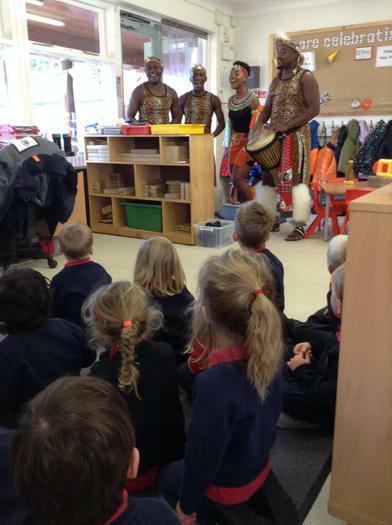 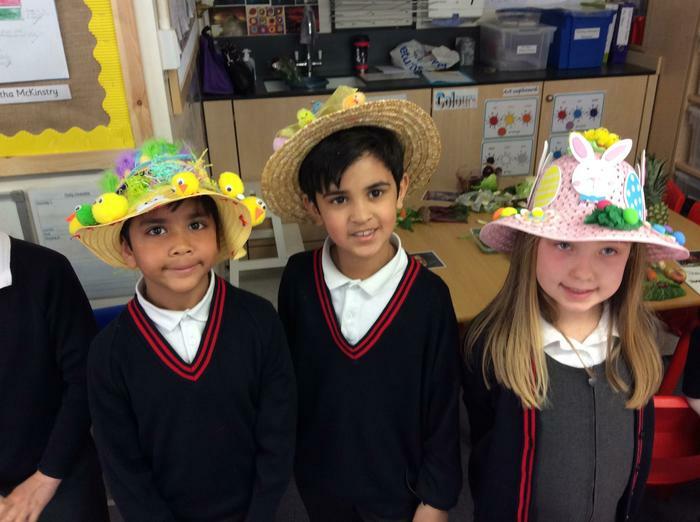 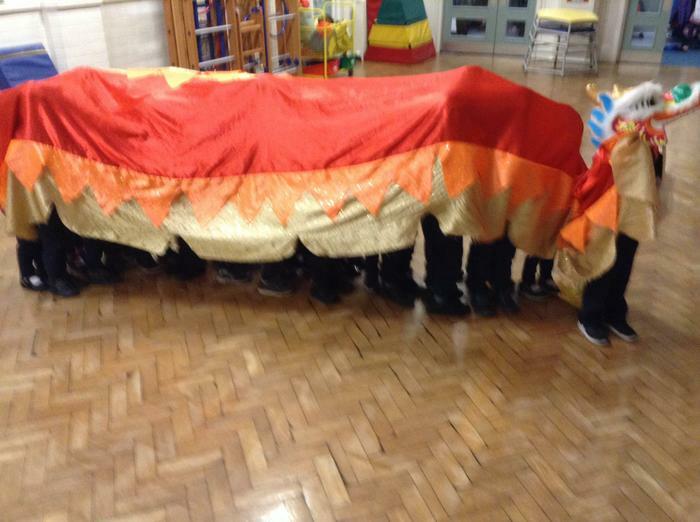 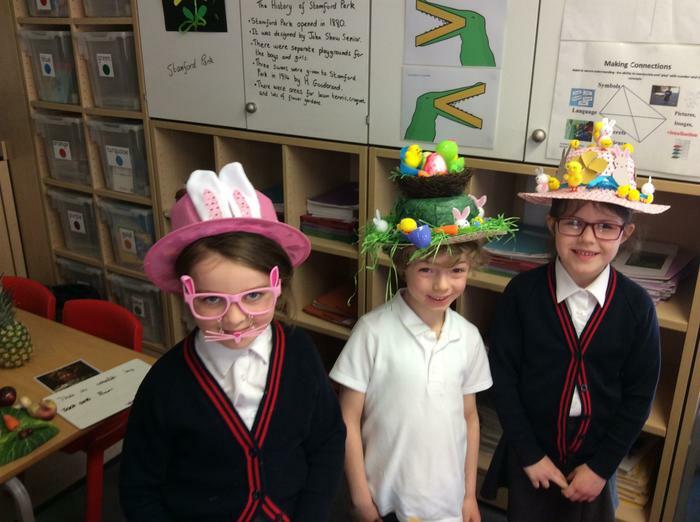 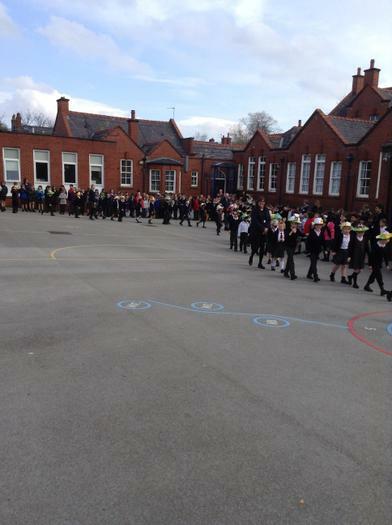 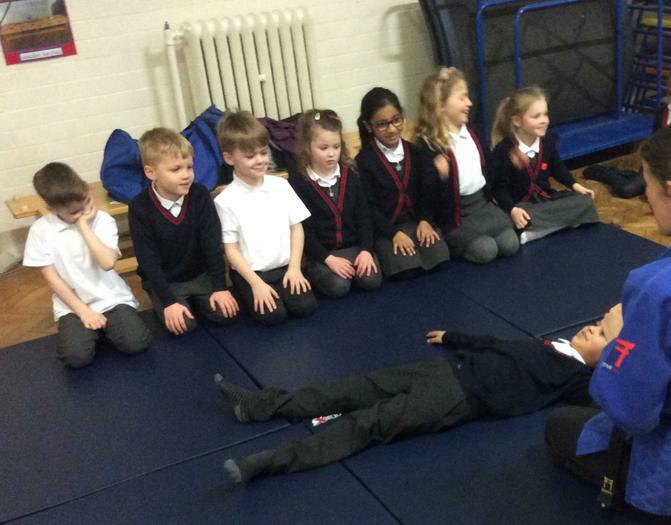 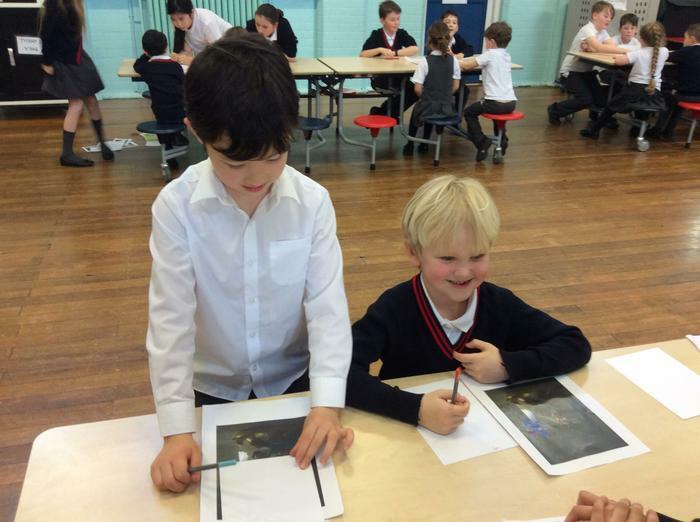 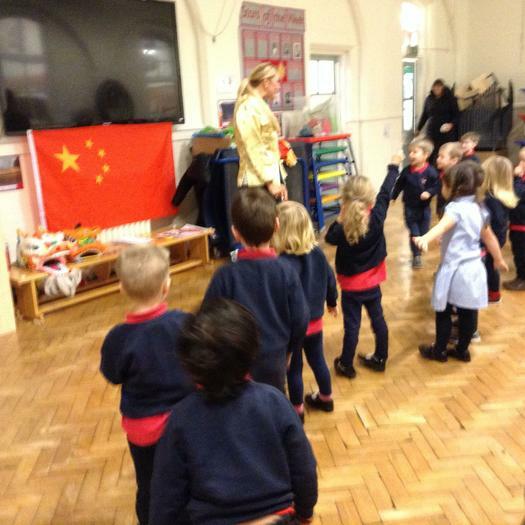 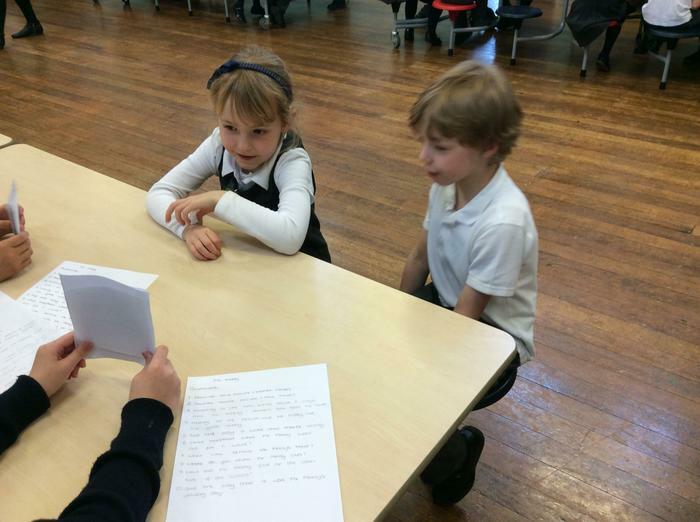 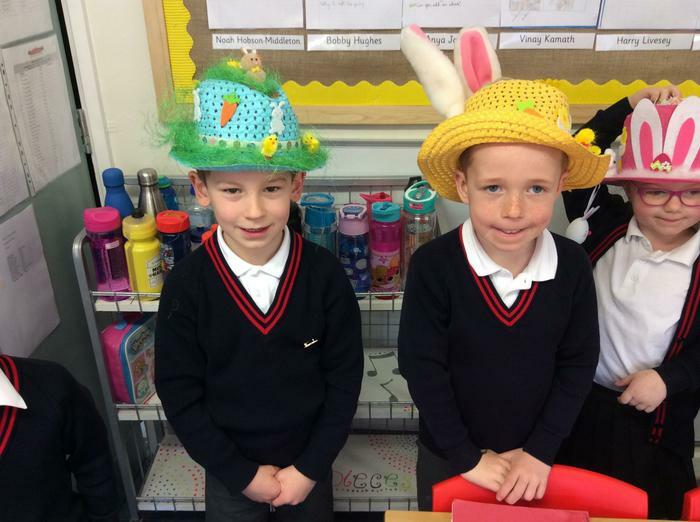 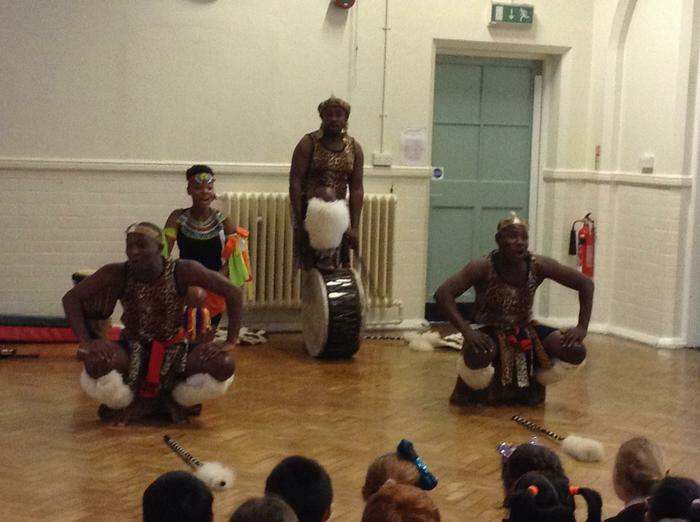 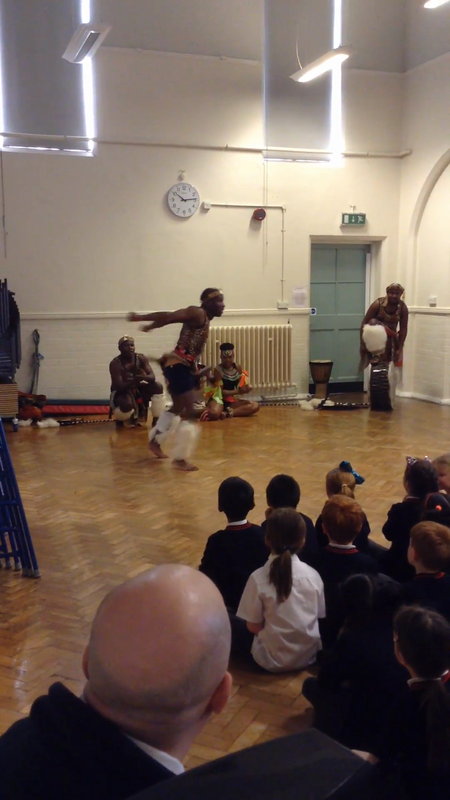 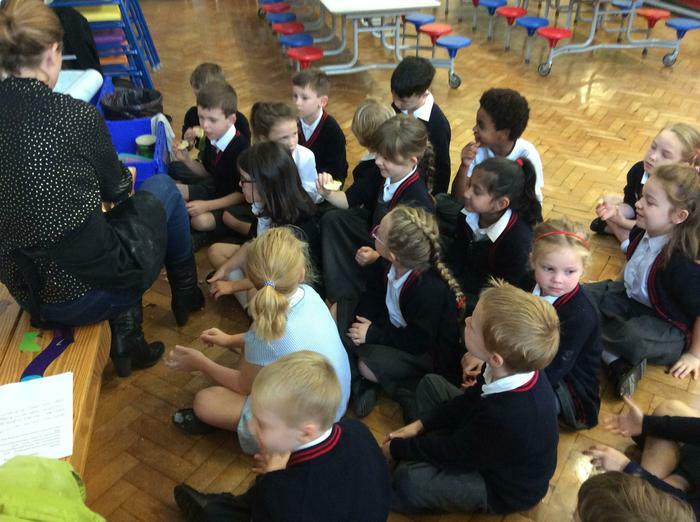 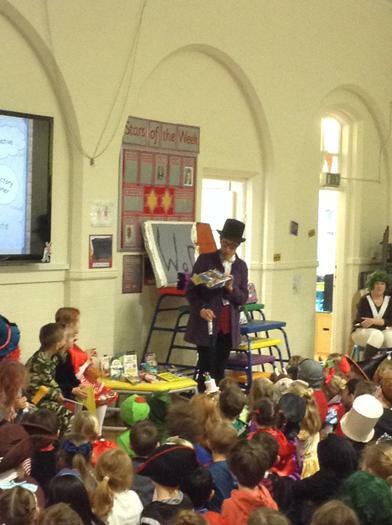 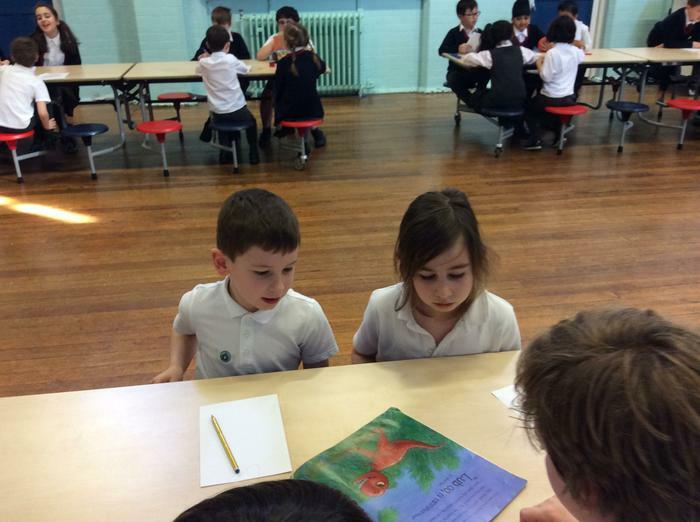 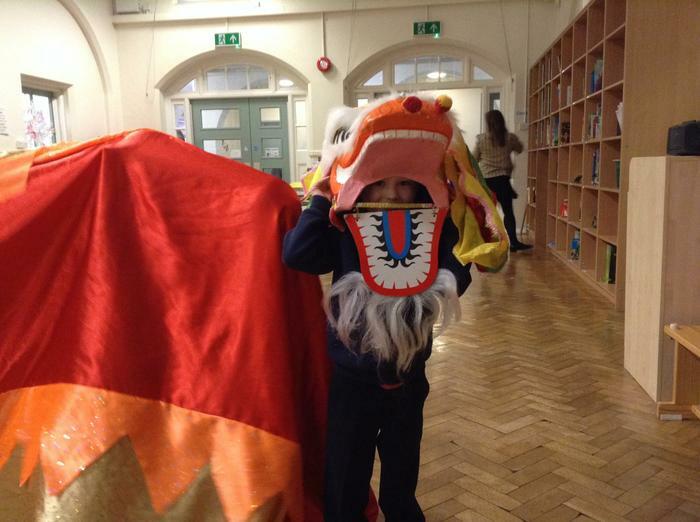 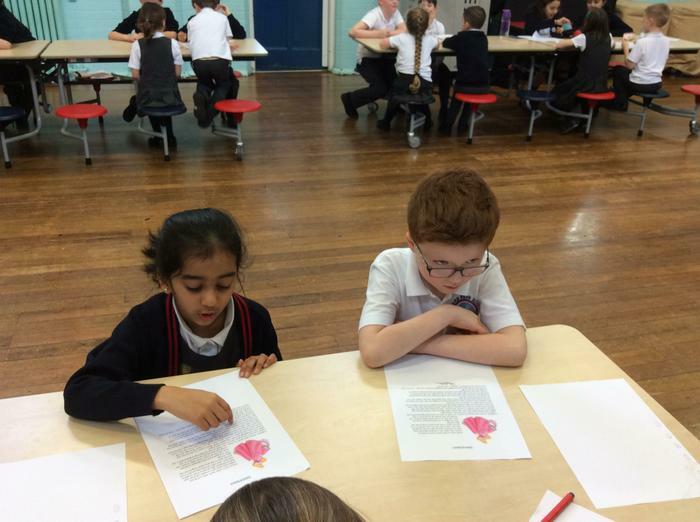 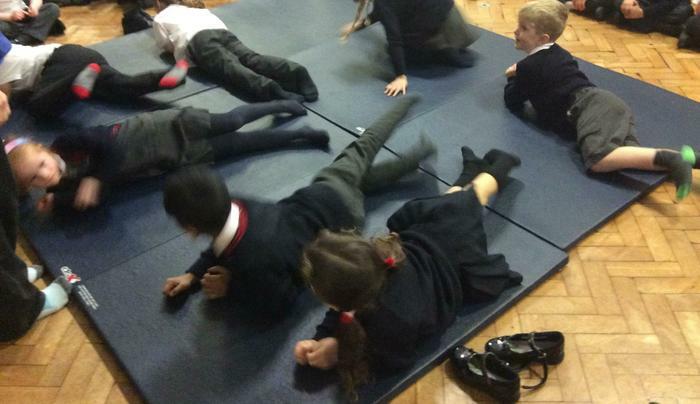 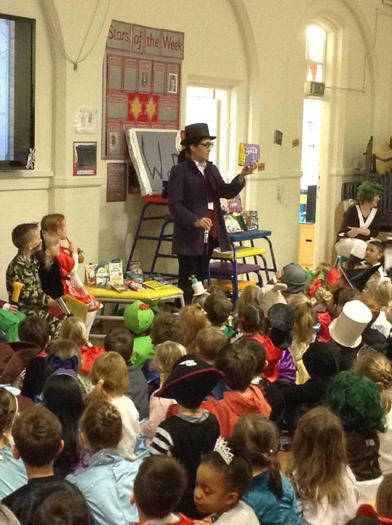 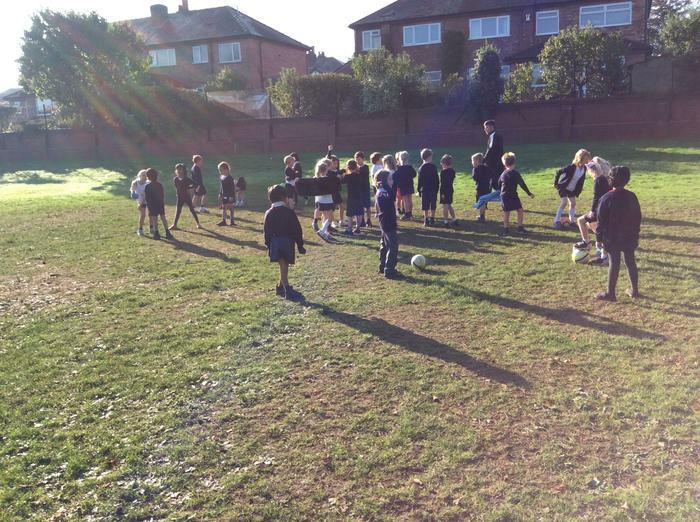 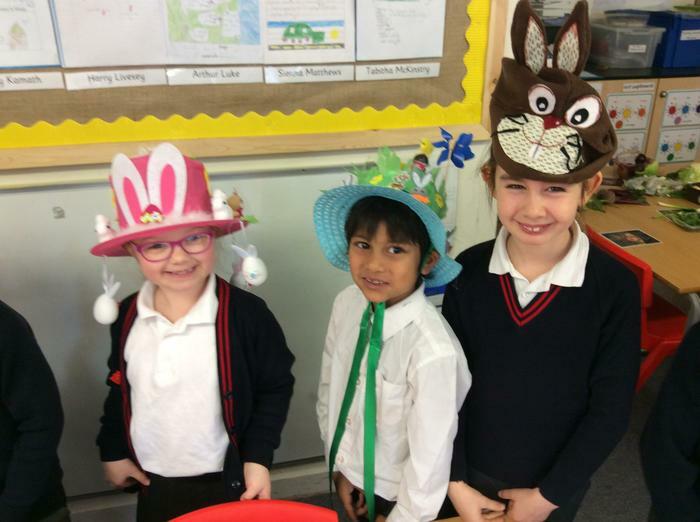 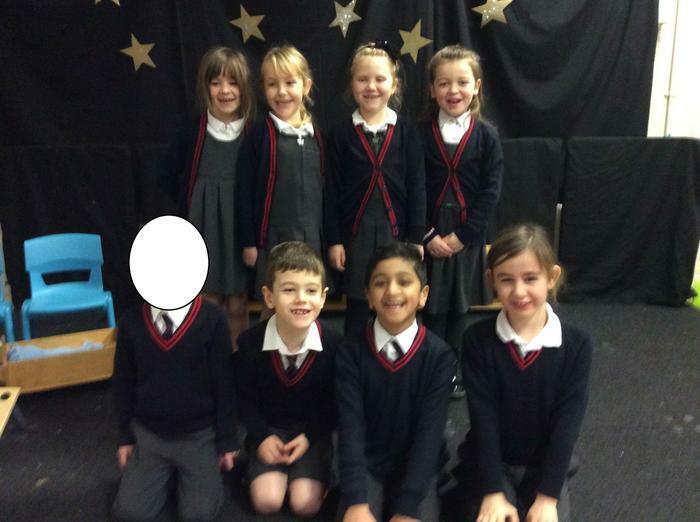 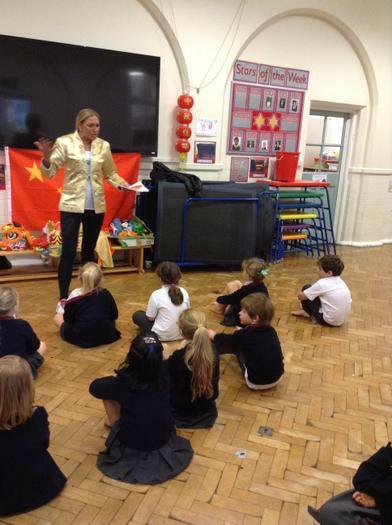 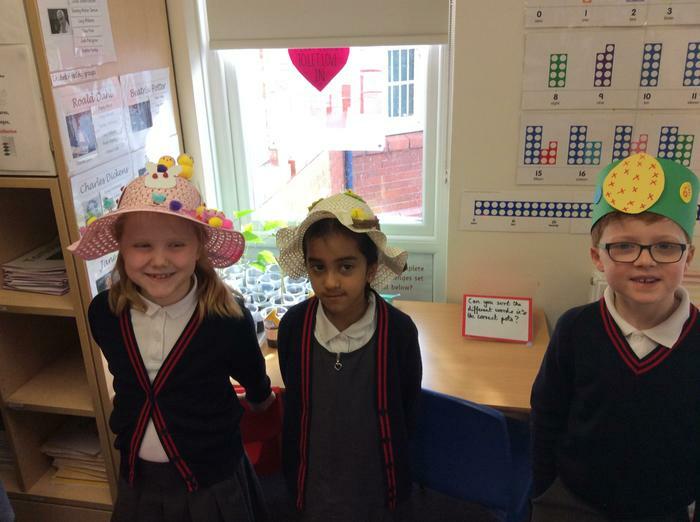 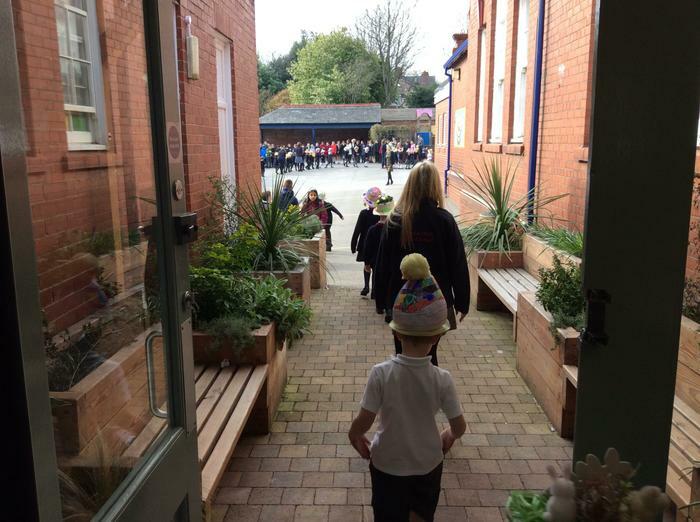 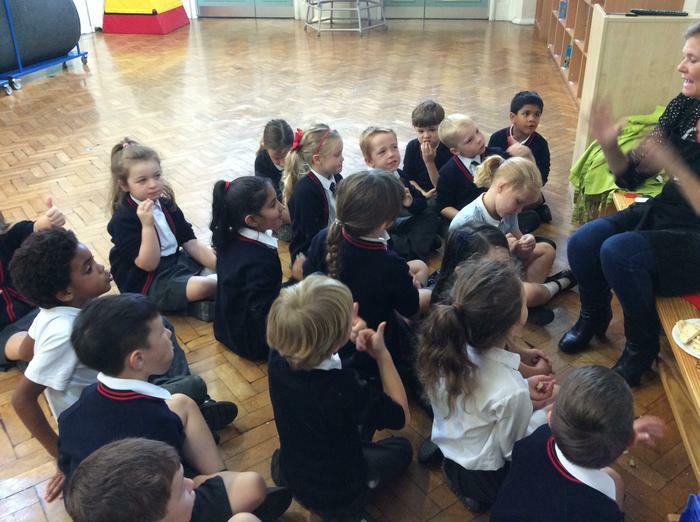 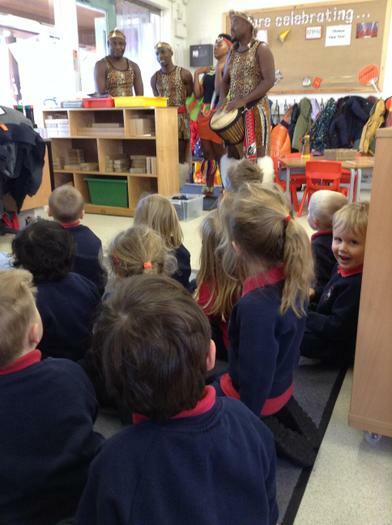 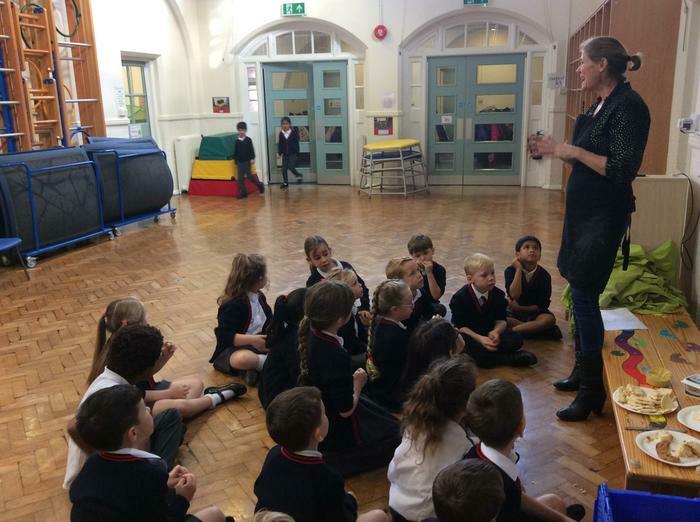 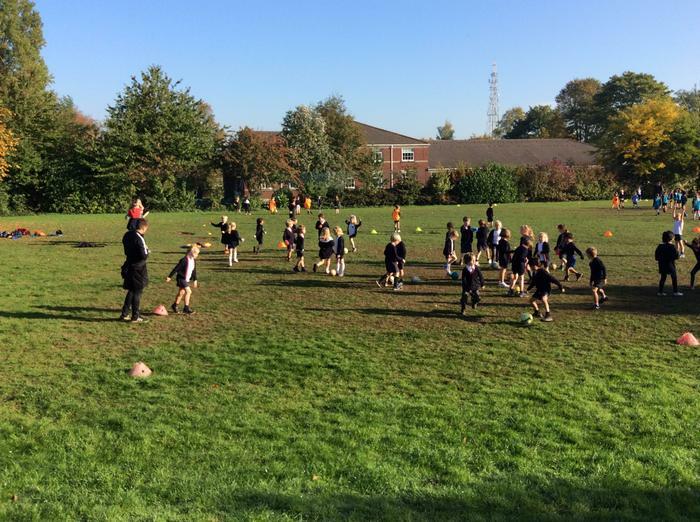 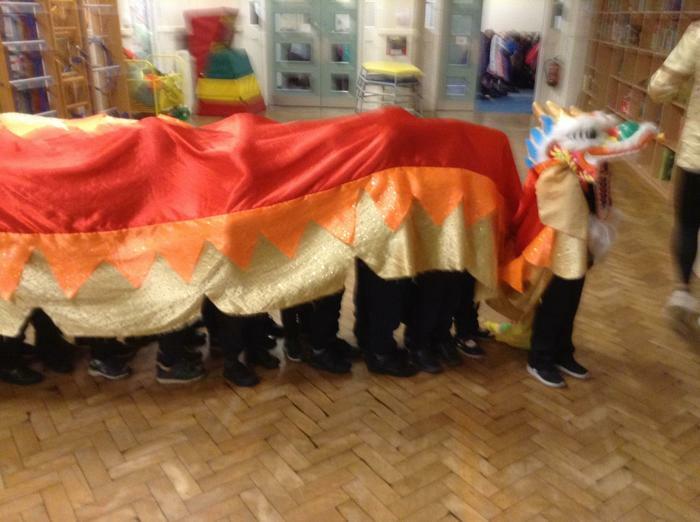 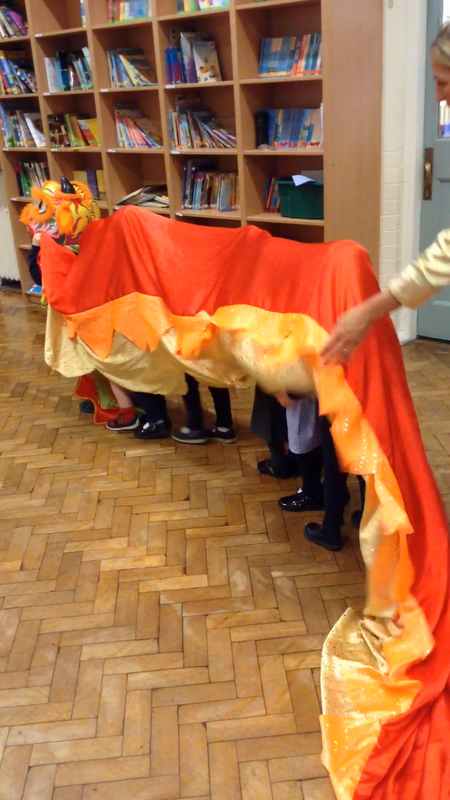 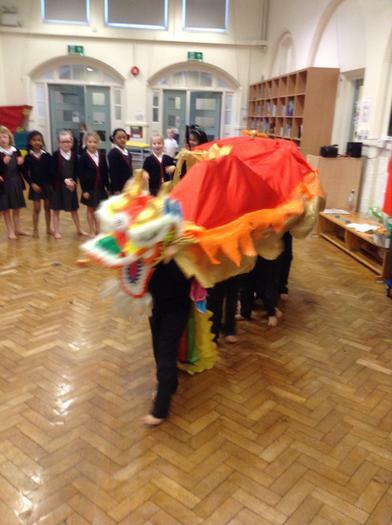 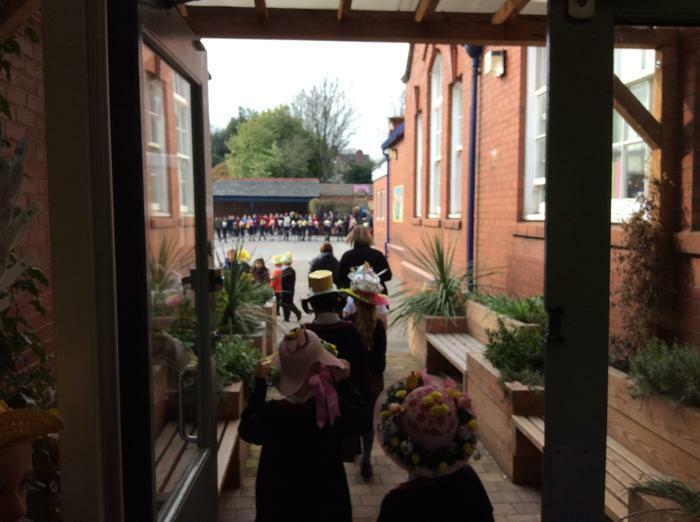 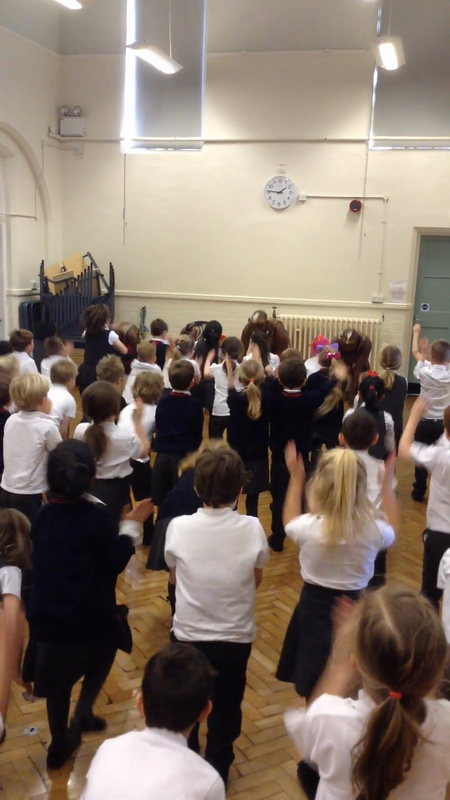 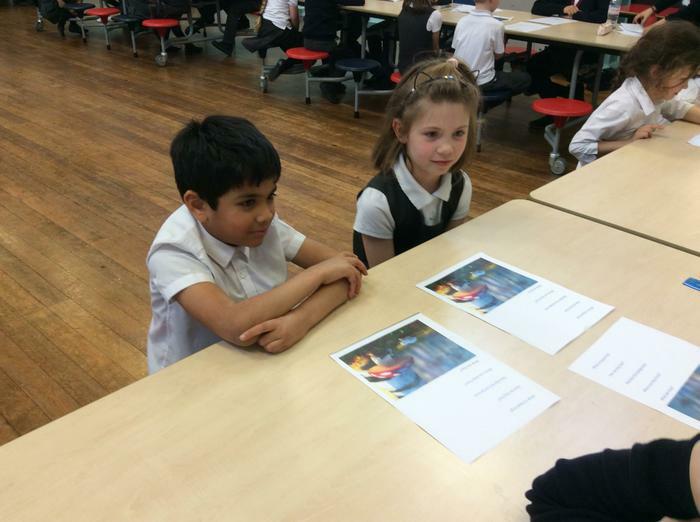 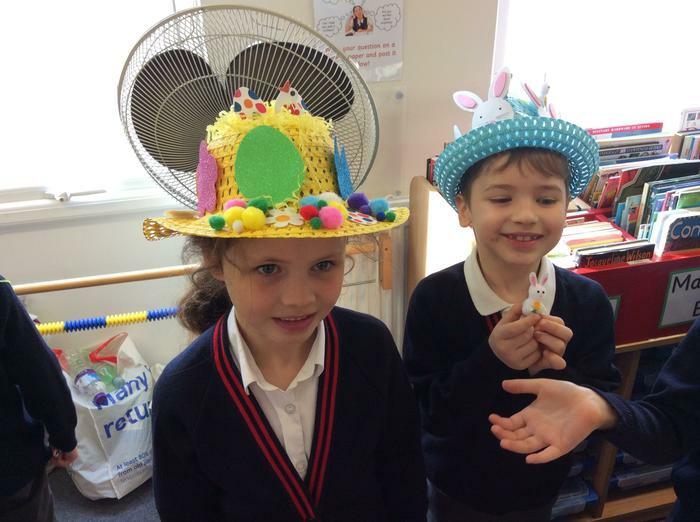 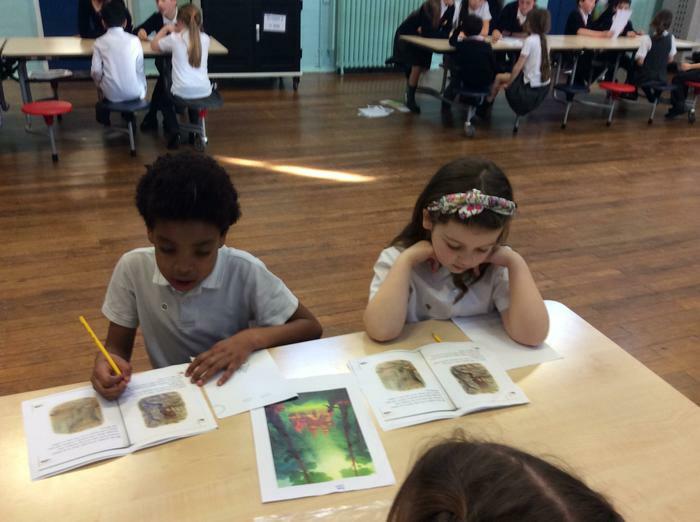 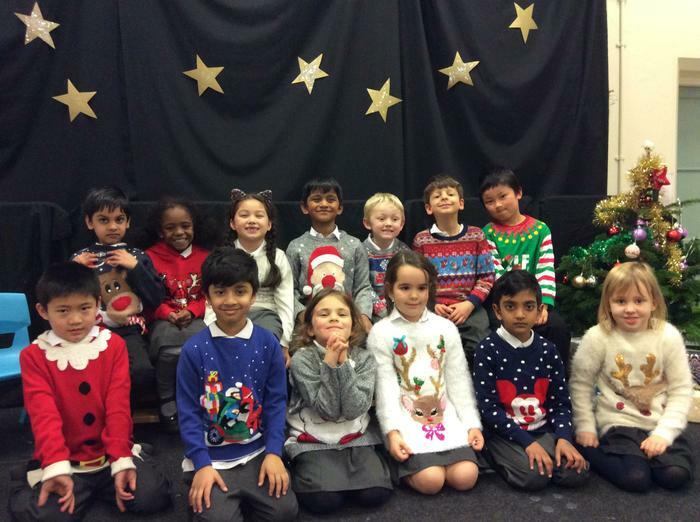 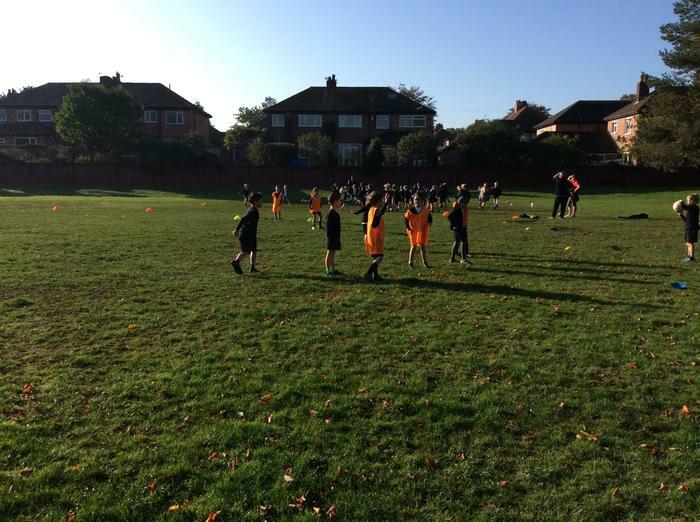 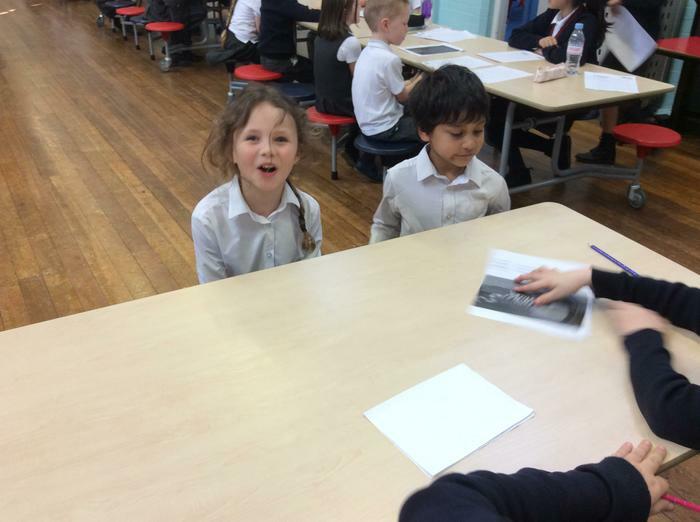 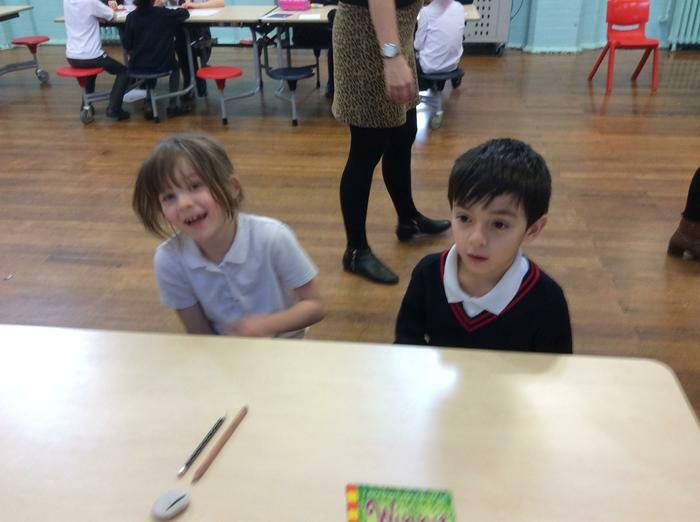 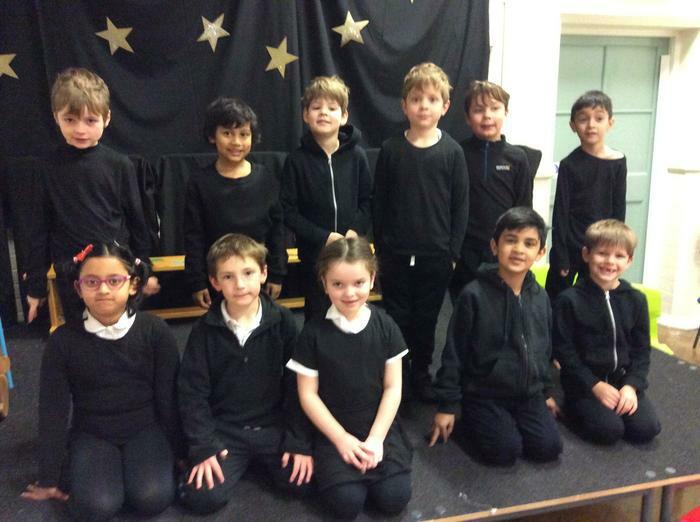 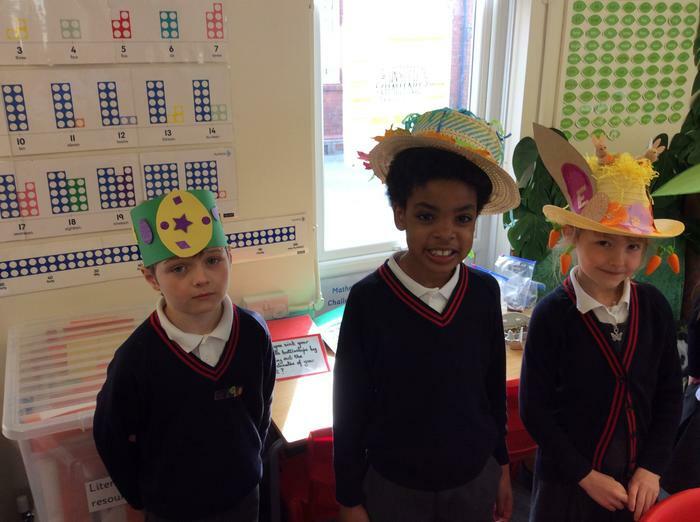 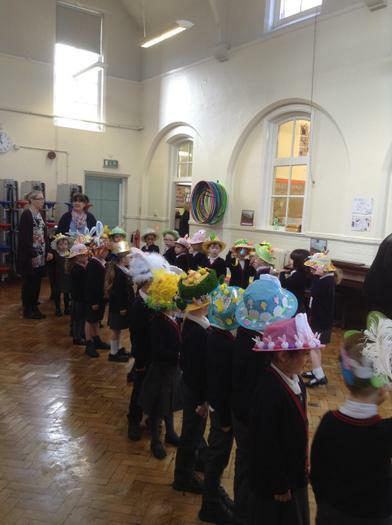 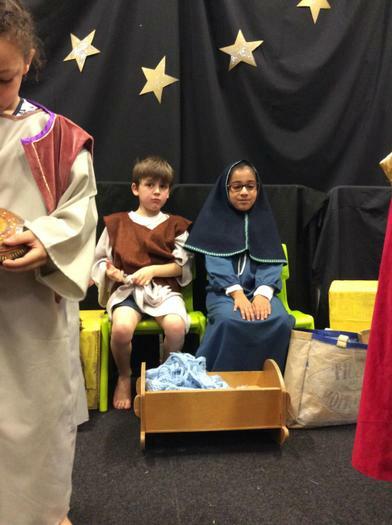 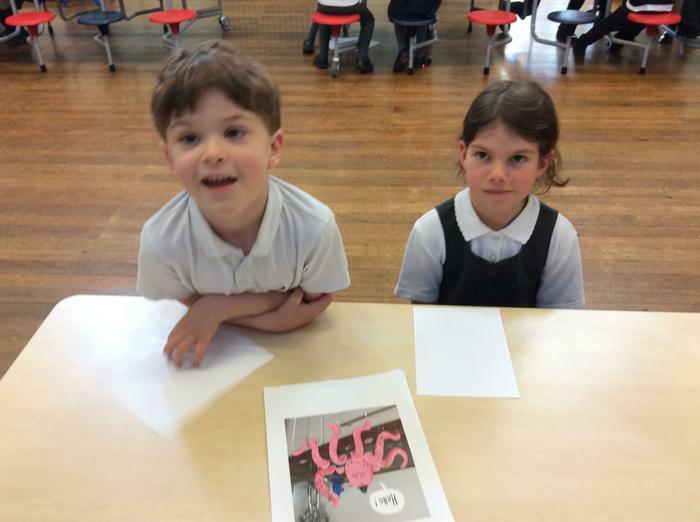 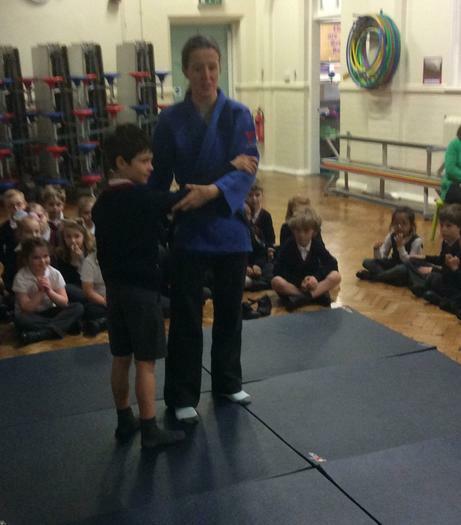 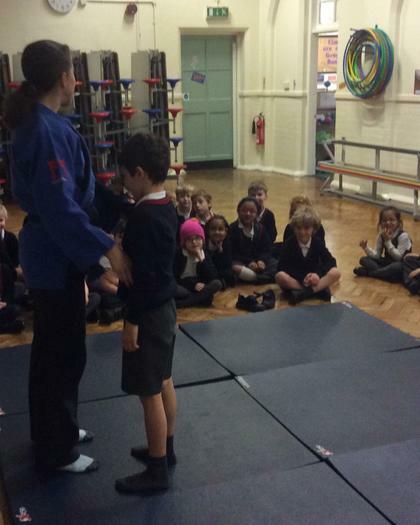 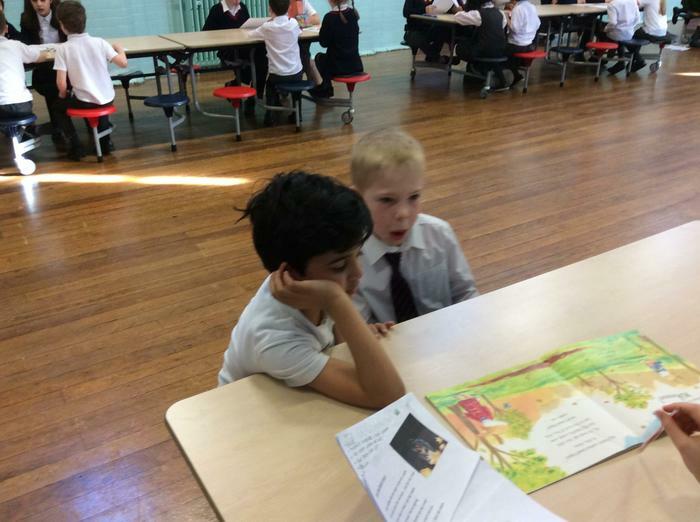 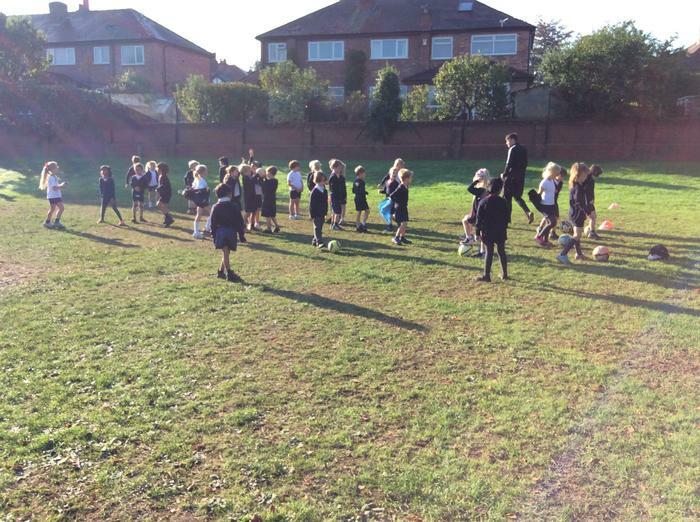 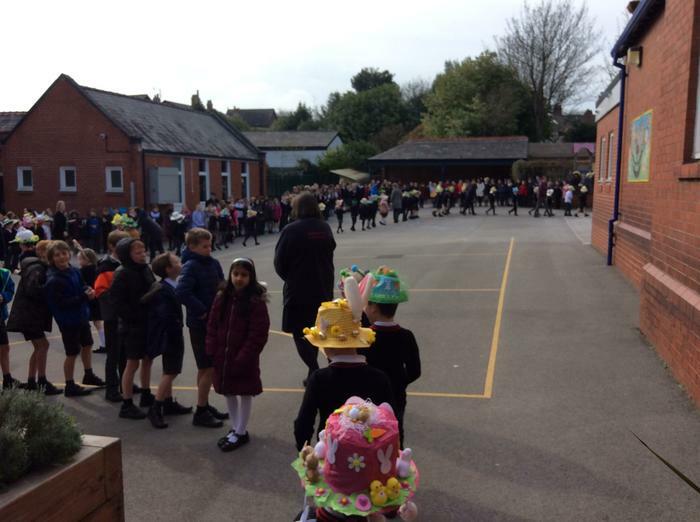 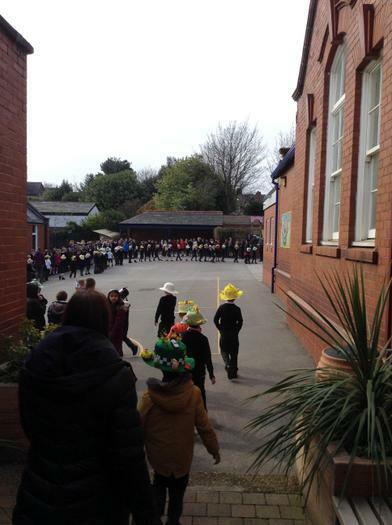 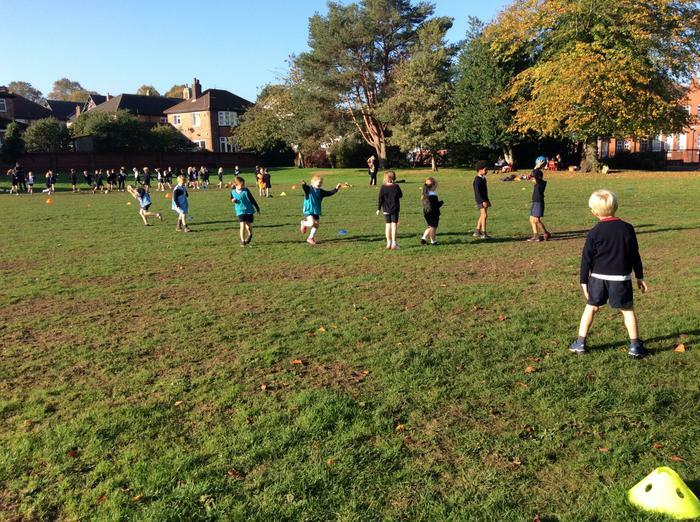 The Year 2 children visited the Junior School to take part in a joint lesson with the Year 6. 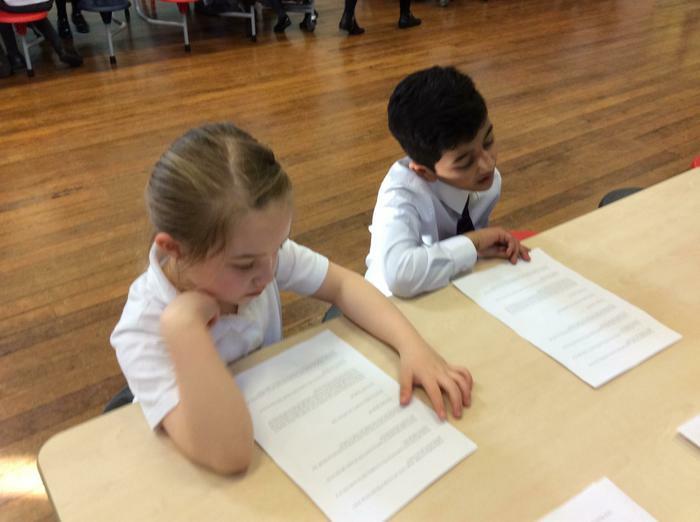 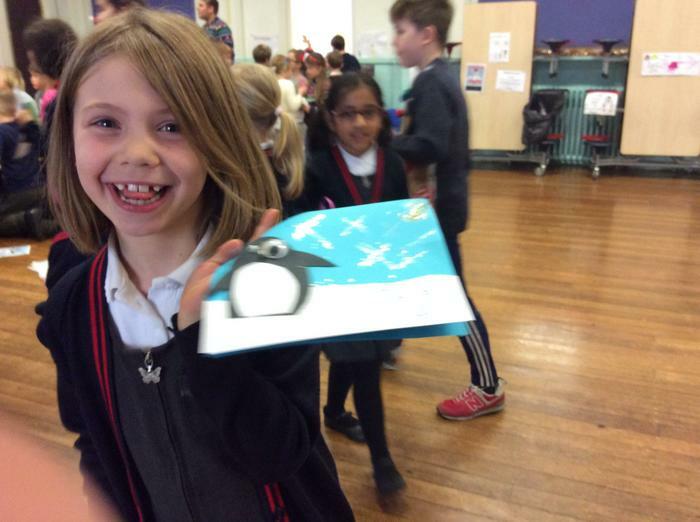 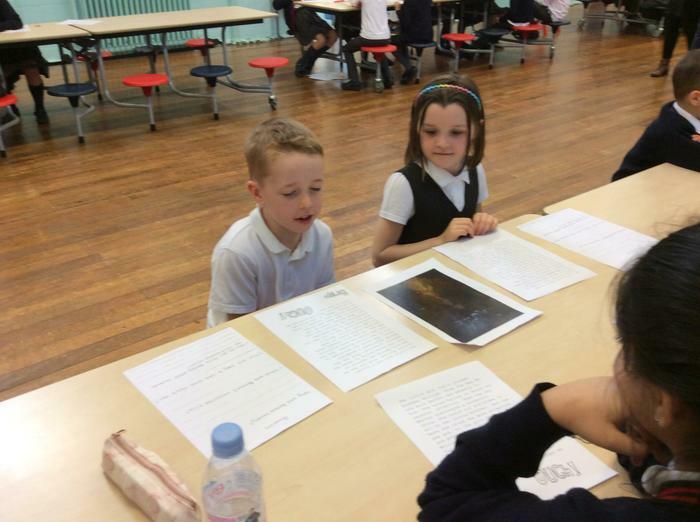 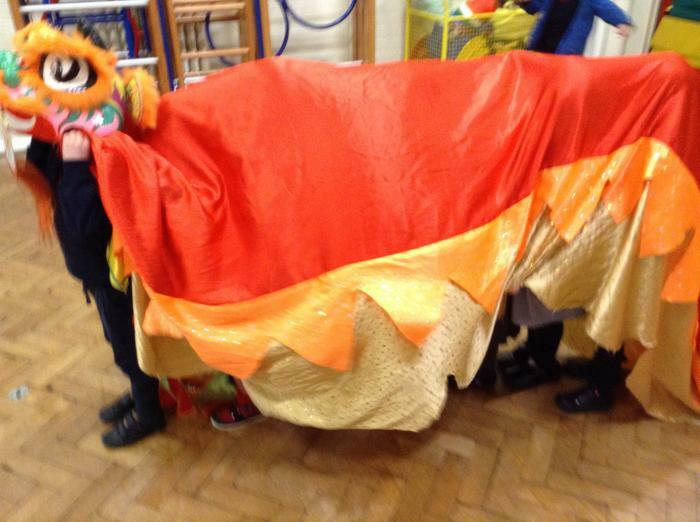 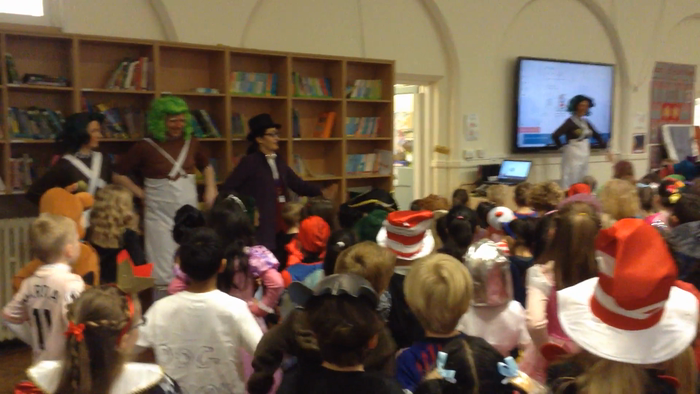 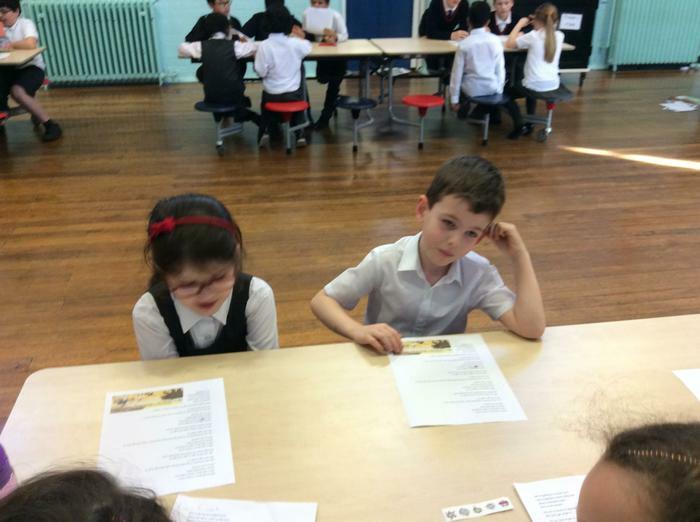 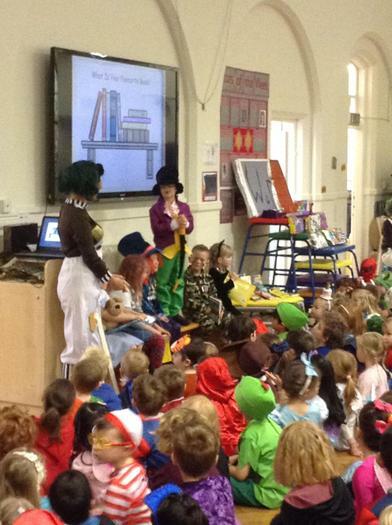 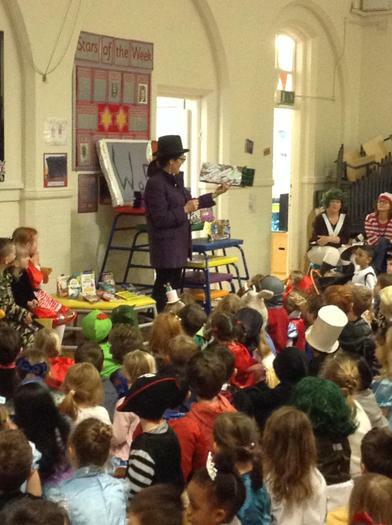 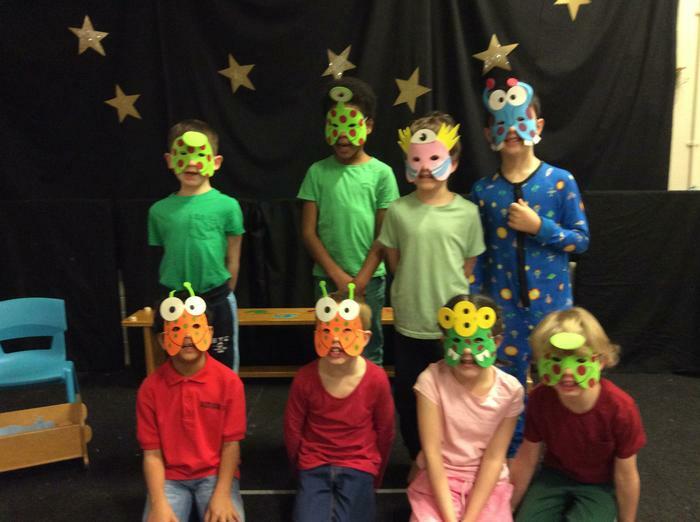 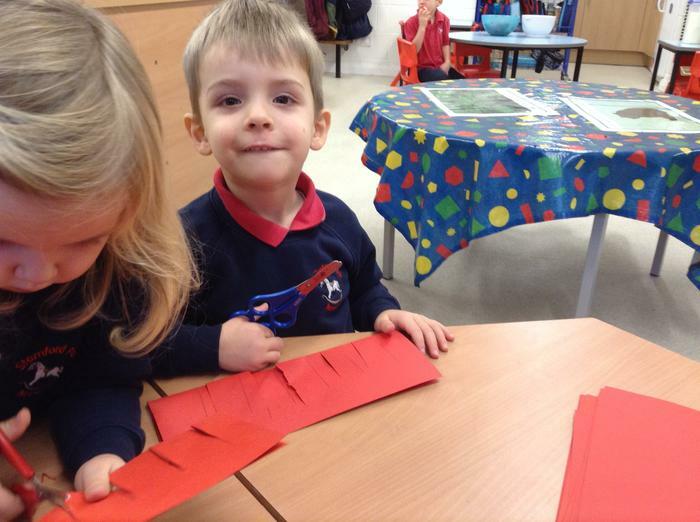 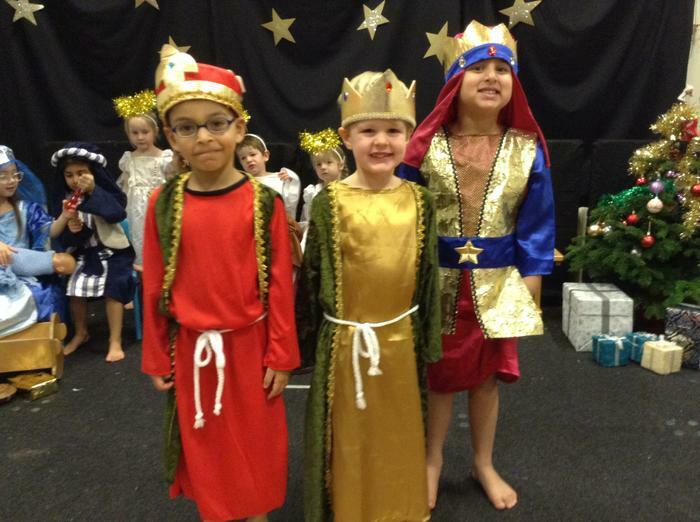 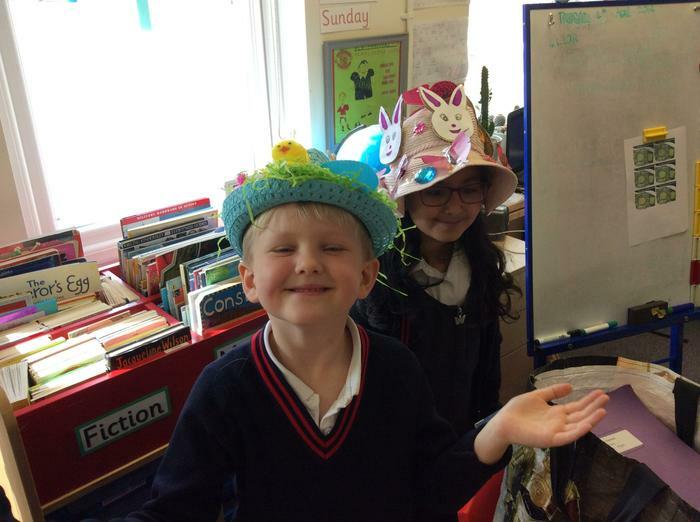 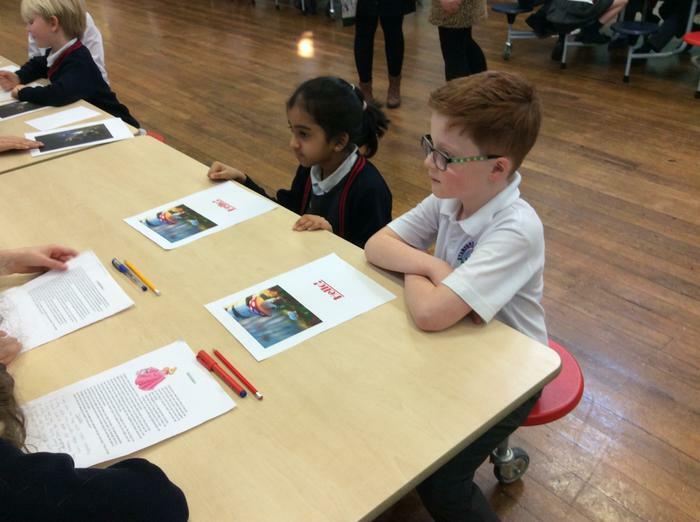 The older children prepared age appropriate texts for the children to answer comprehension questions on! 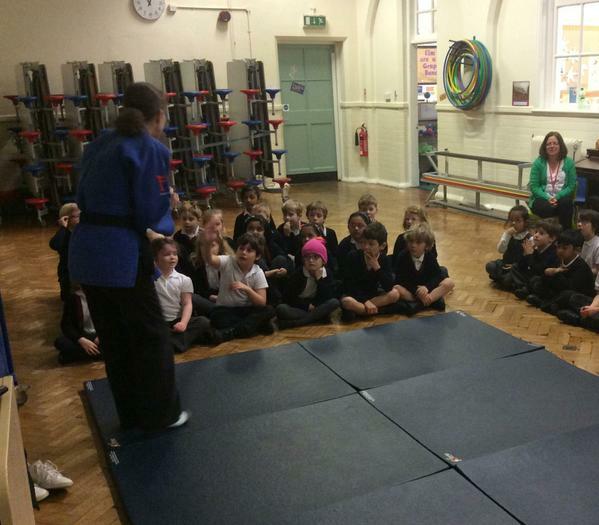 Many thanks to the Year 6 teachers for organising. 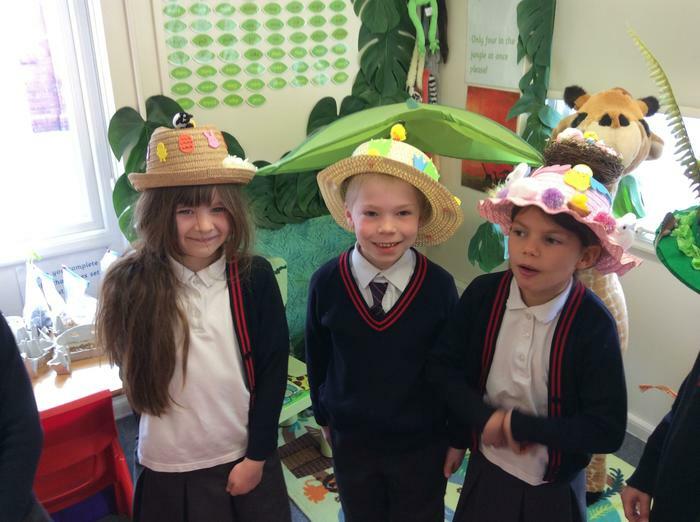 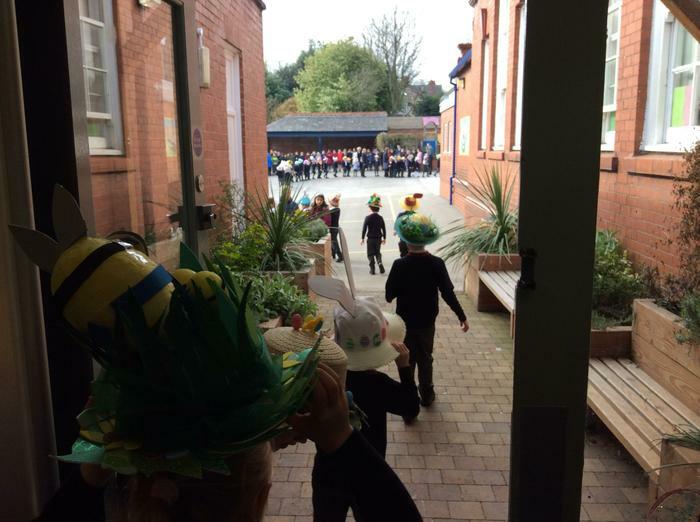 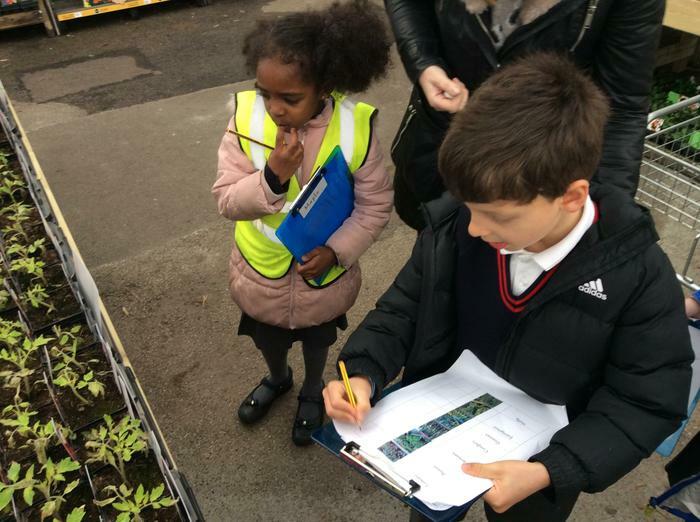 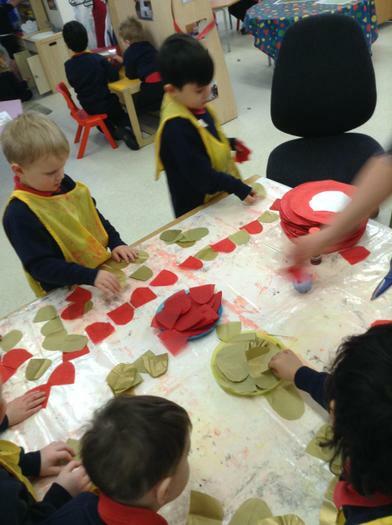 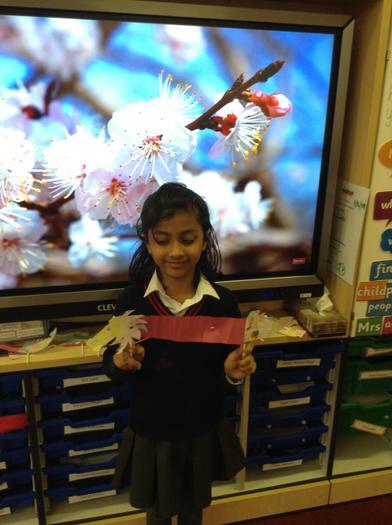 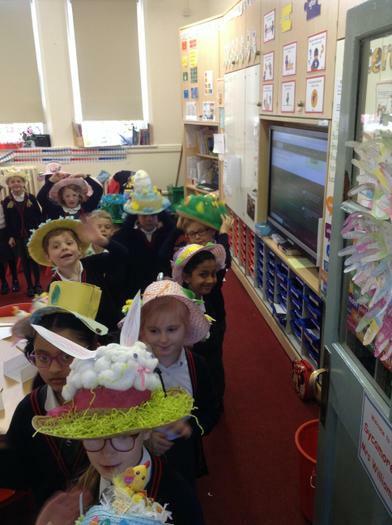 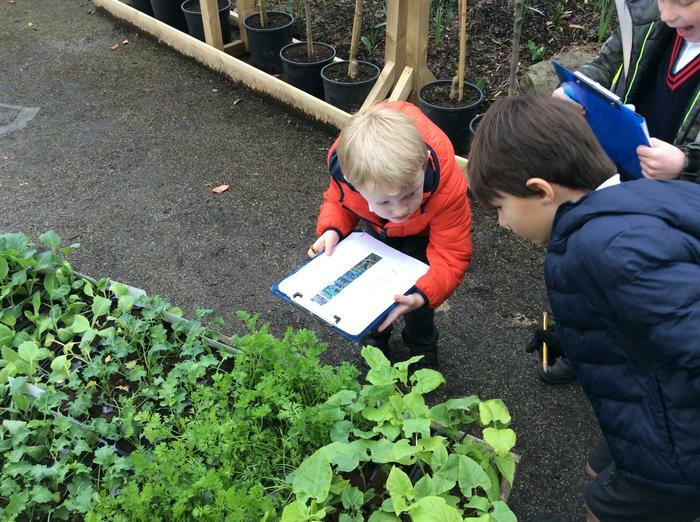 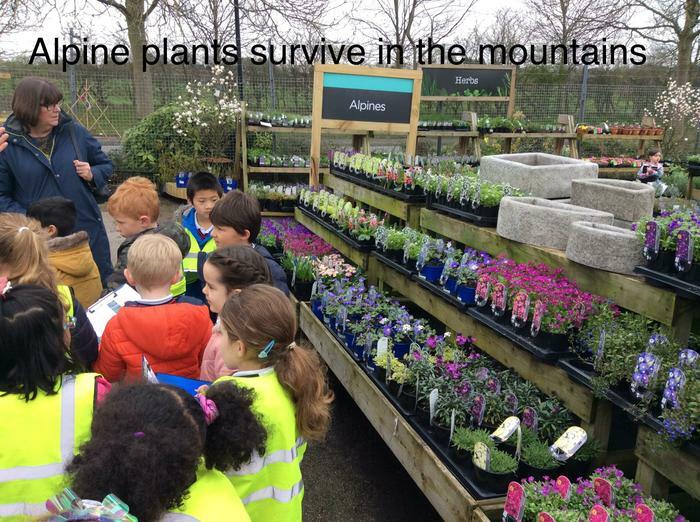 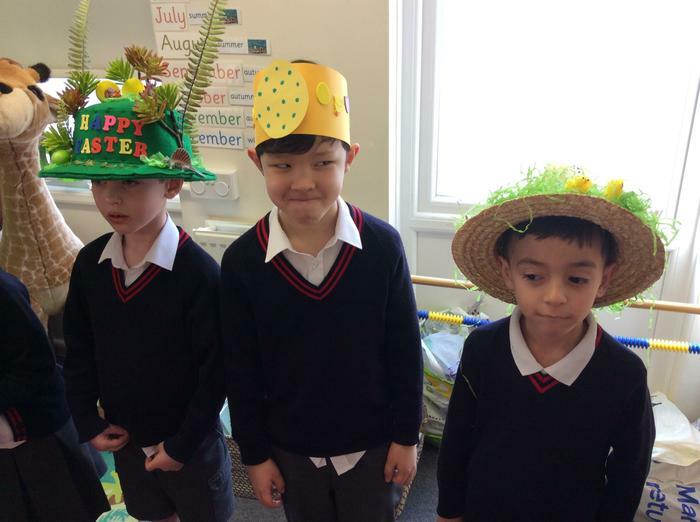 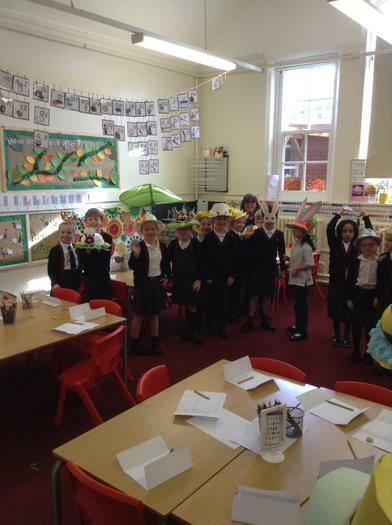 The Year 1 children’s topic this half term is: How do plants survive? 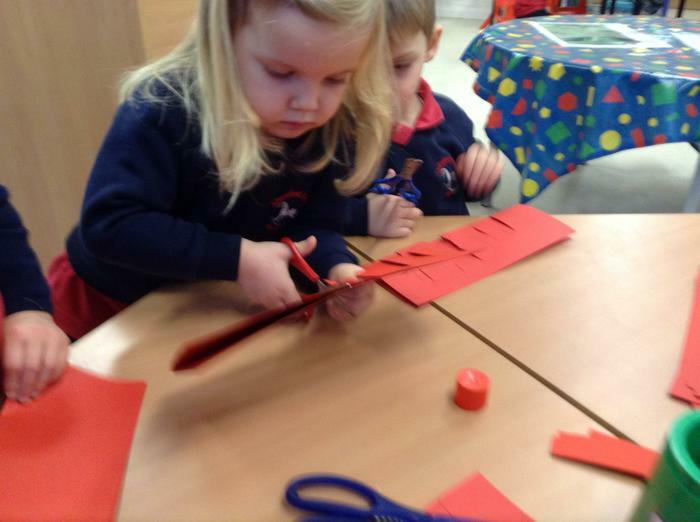 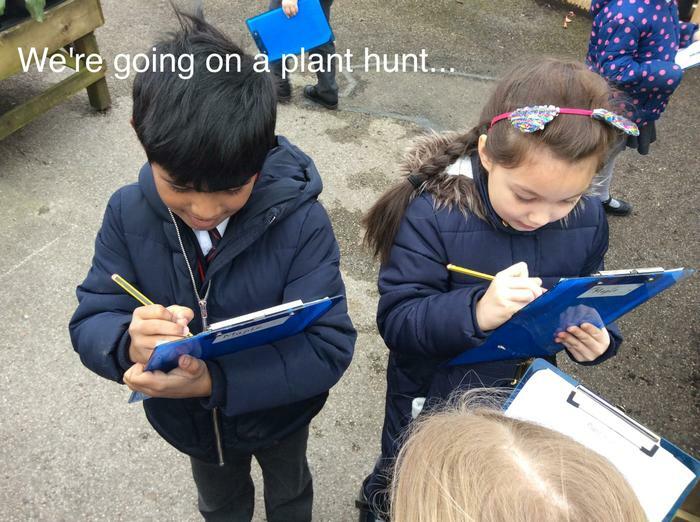 We are looking carefully at the parts of the plant and what they need to grow. 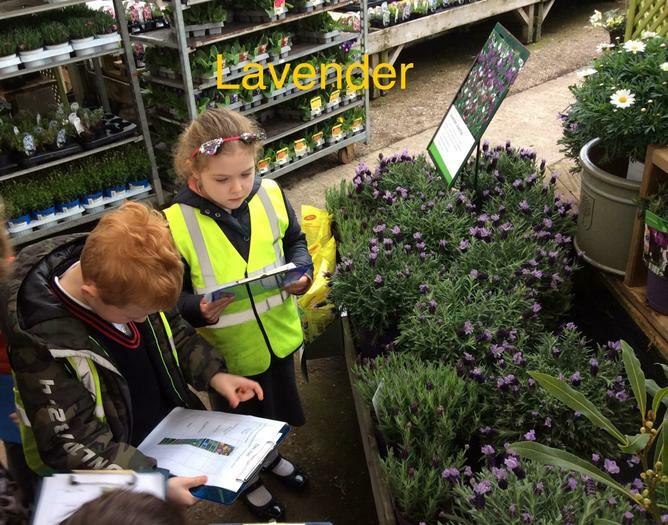 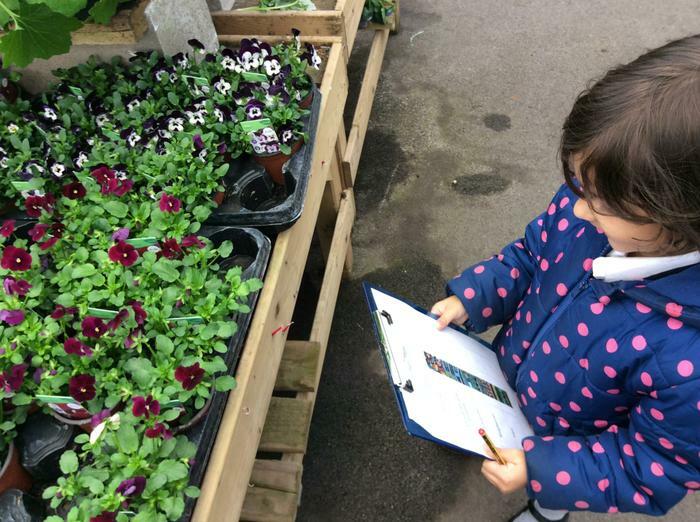 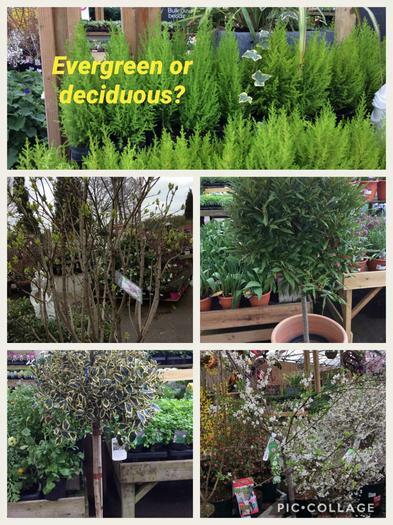 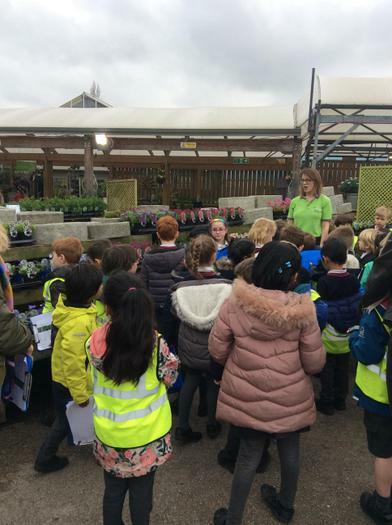 On Thursday 21st March we took a trip to our local garden centre, Wyevale! 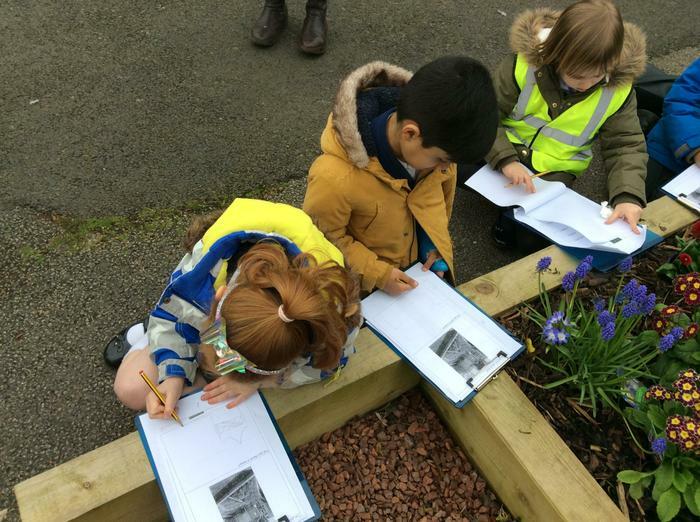 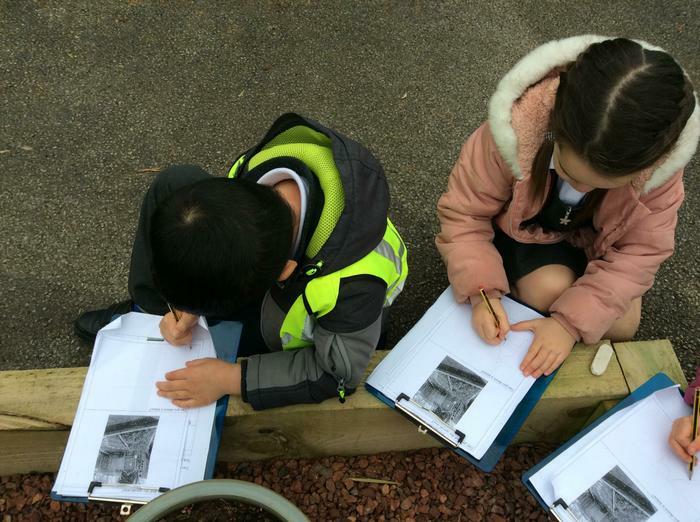 We had a wonderful time on our tour with Laura, searching for plants and sketching our favourite. 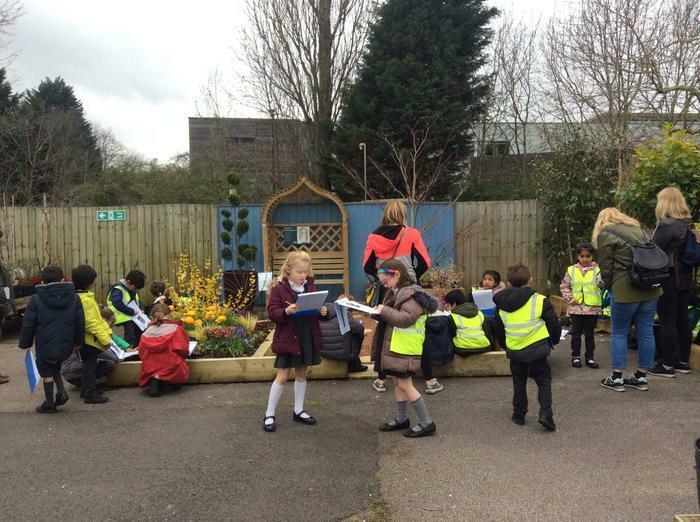 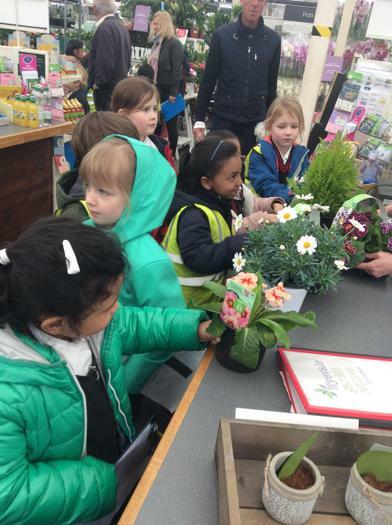 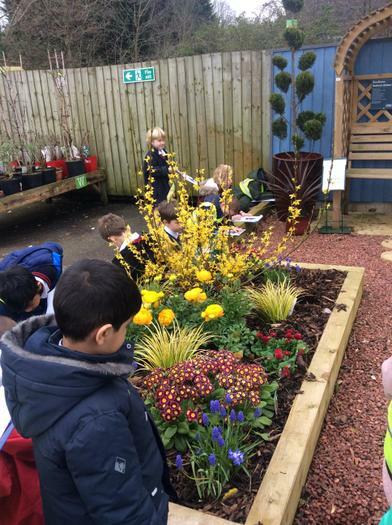 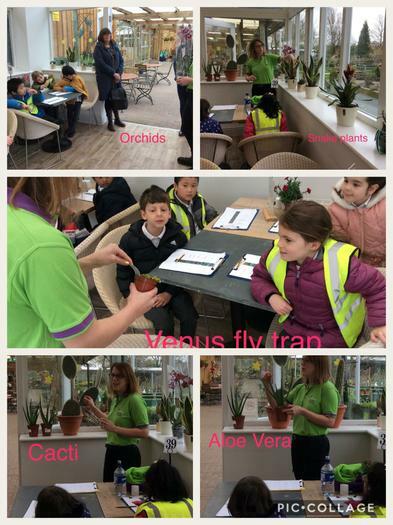 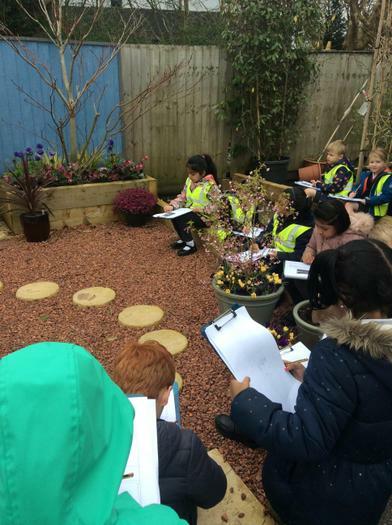 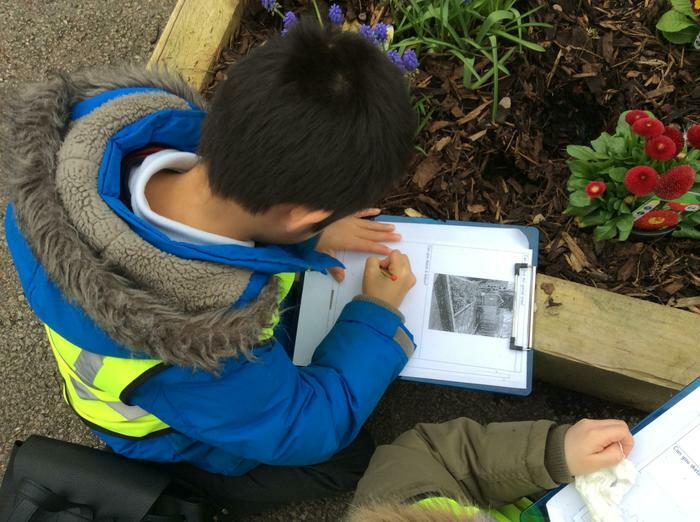 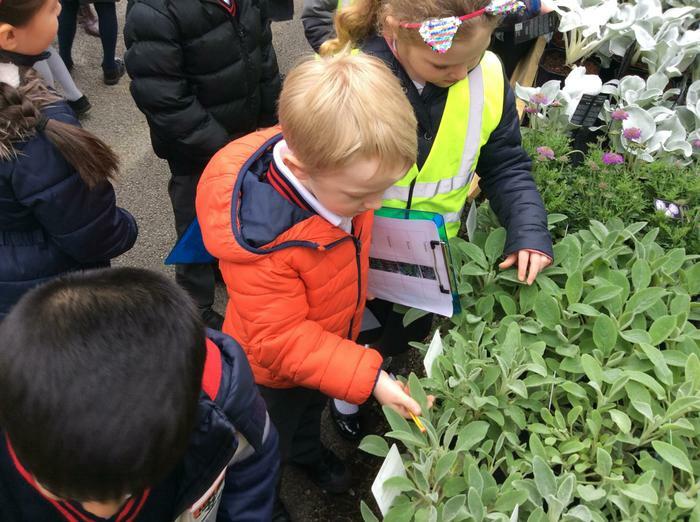 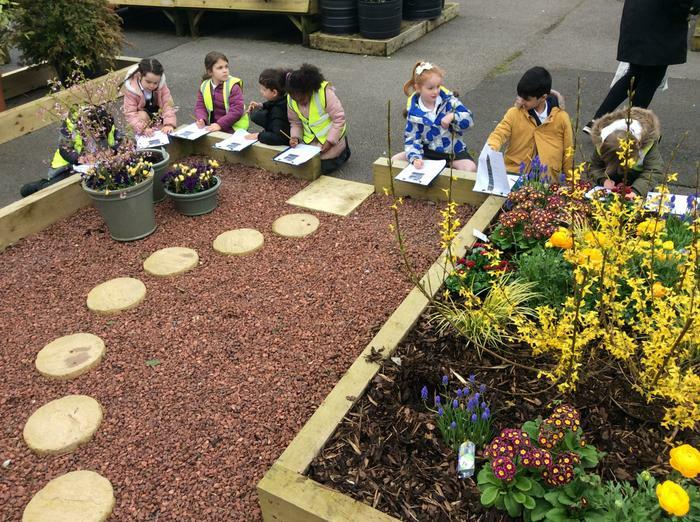 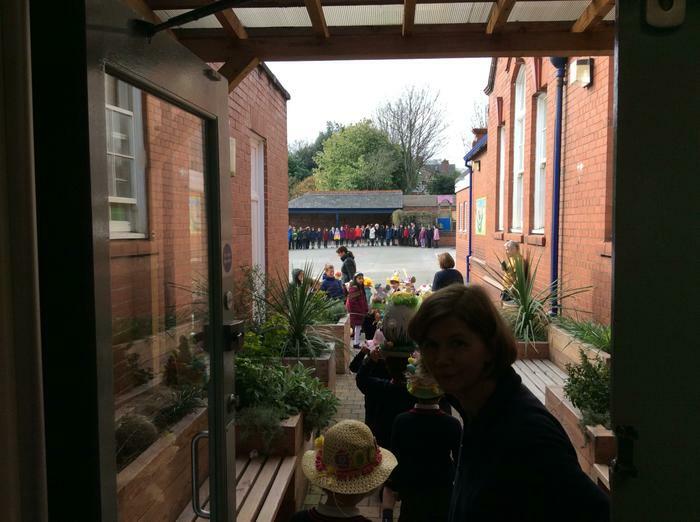 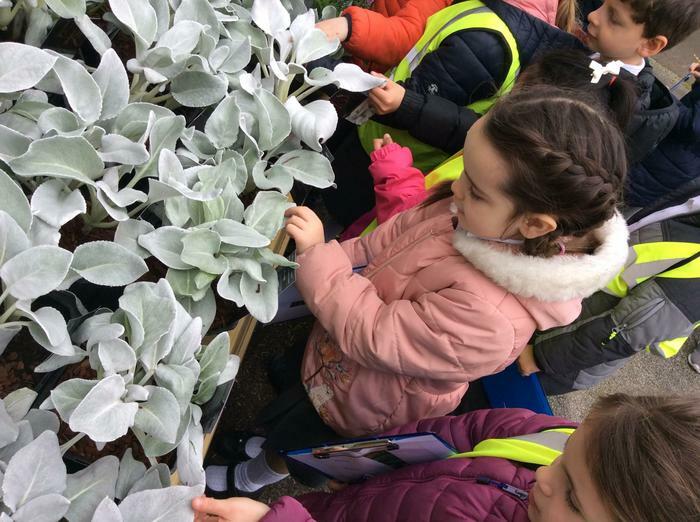 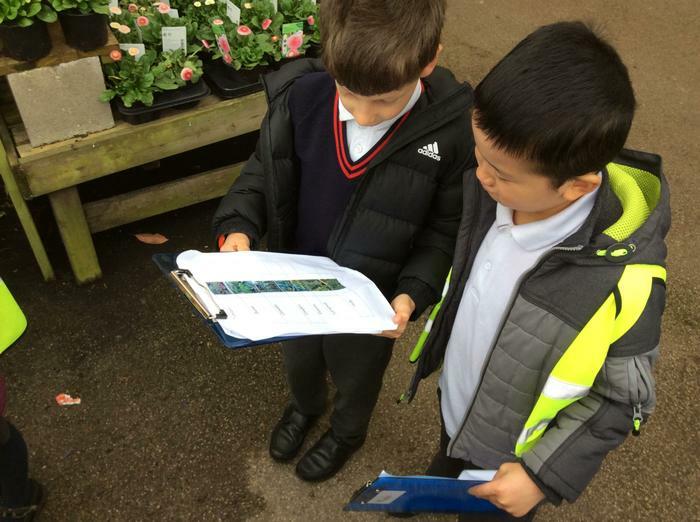 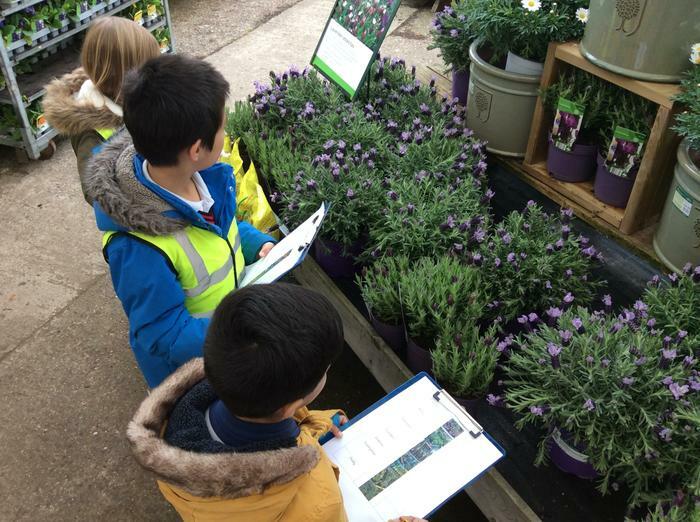 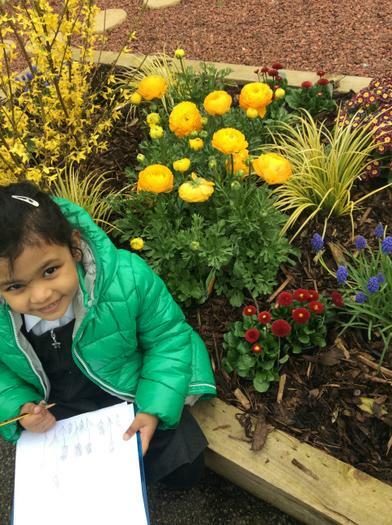 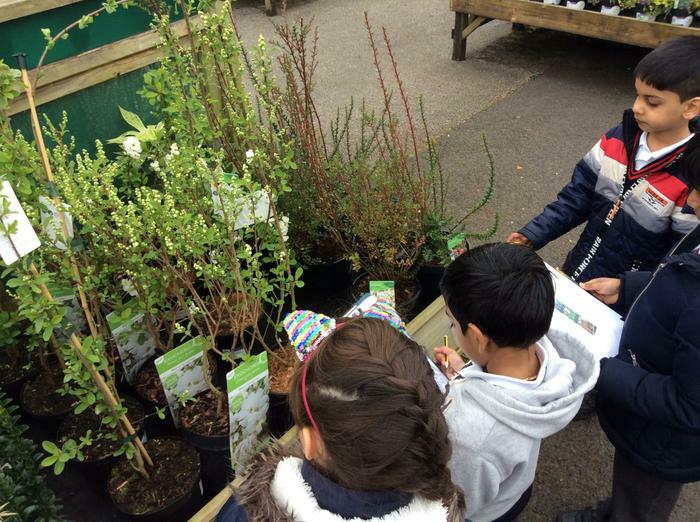 As we are developing our outside area, we also took the opportunity to buy some beautiful plants to put into our flower bed in the playground. 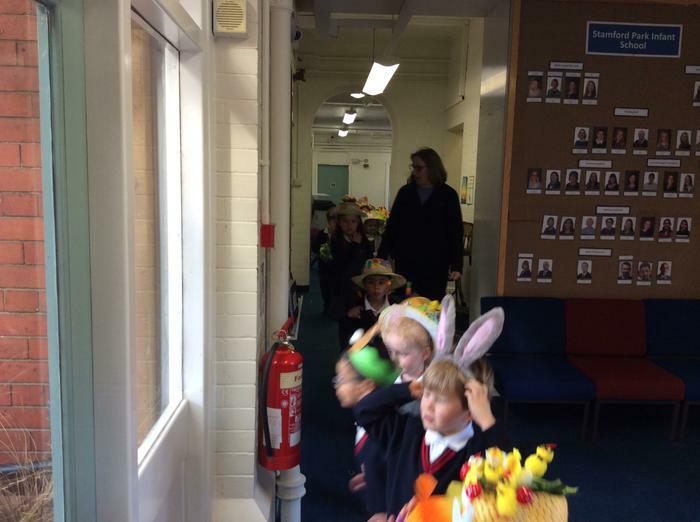 The teachers are certainly ready for today. 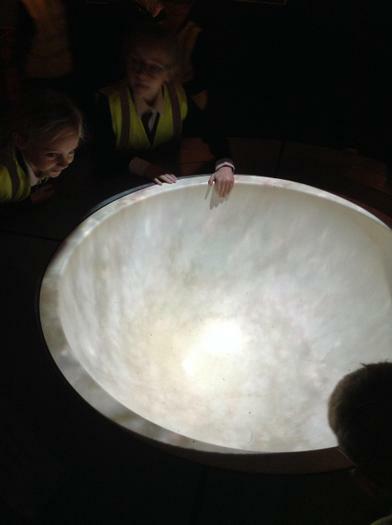 'How can we get to the moon?' 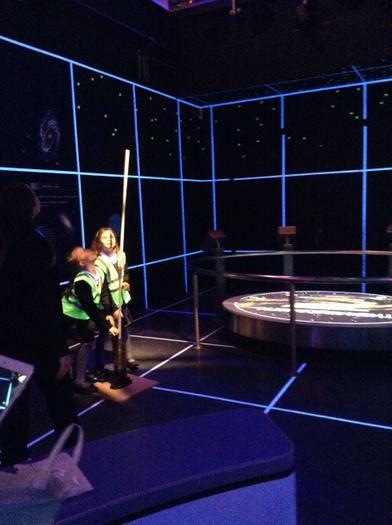 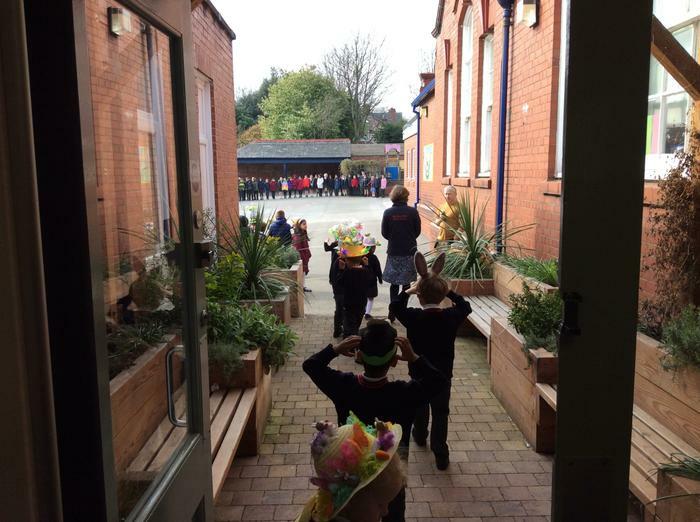 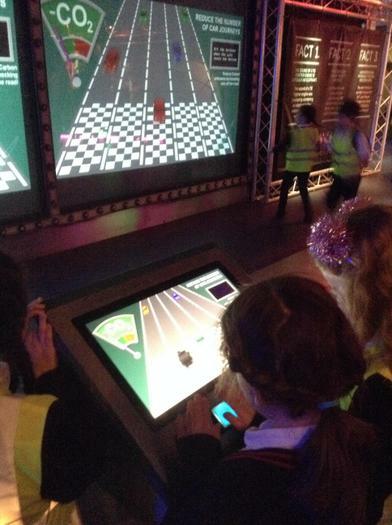 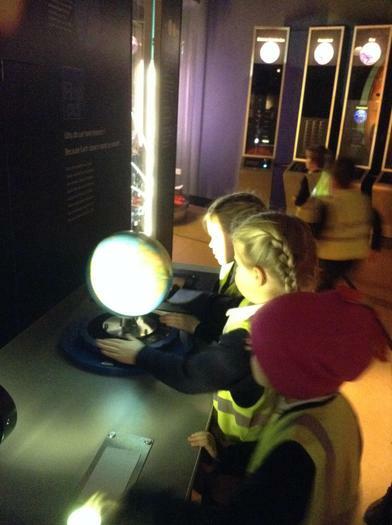 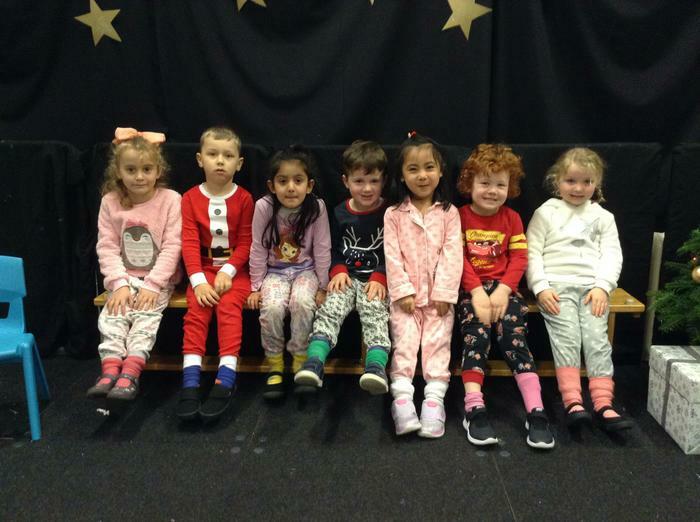 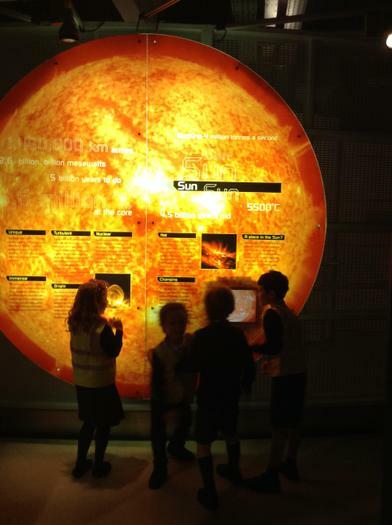 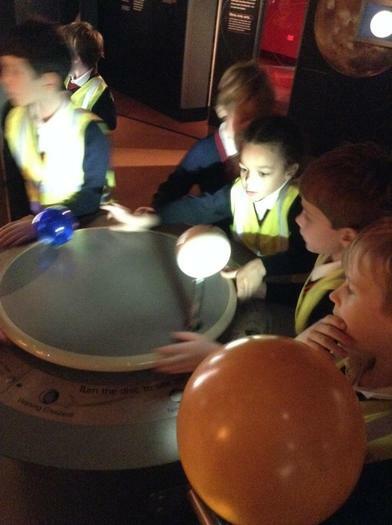 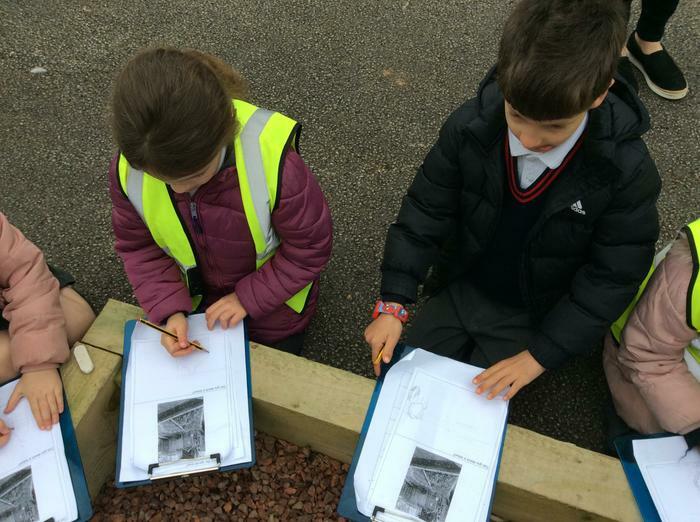 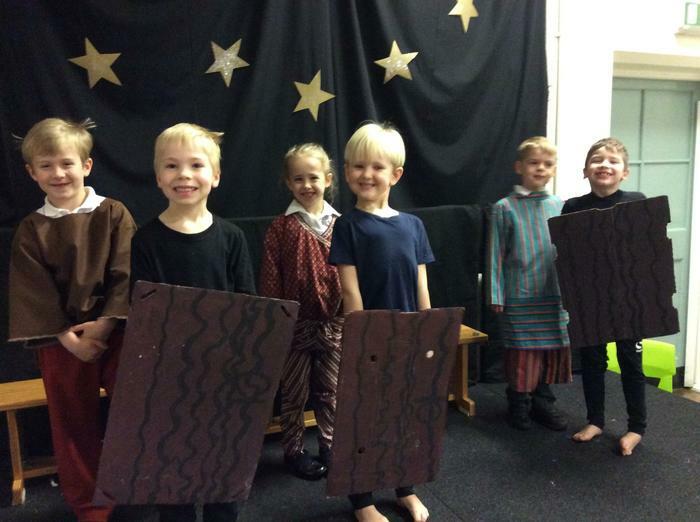 the Year 2 children visited the Spaceport to further enhance their learning. 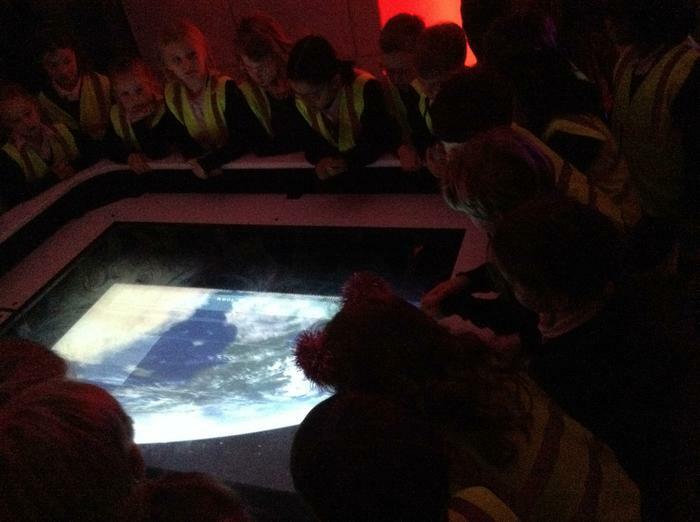 The trip consisted of a flight simulator, an interactive museum, a planetarium and finished with an exciting rocket launch. 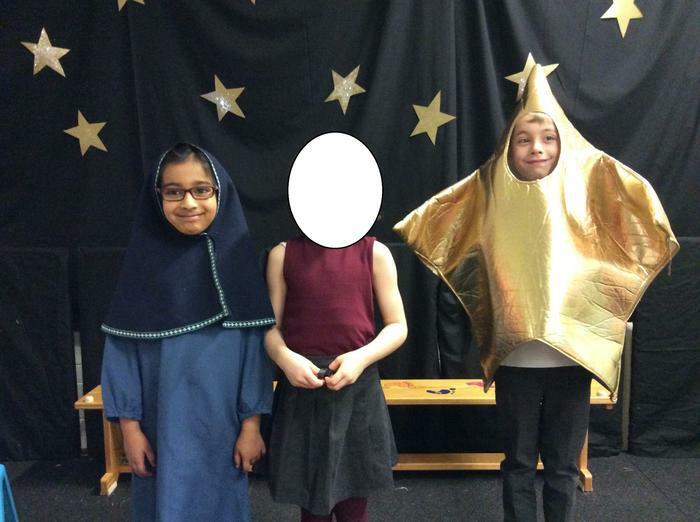 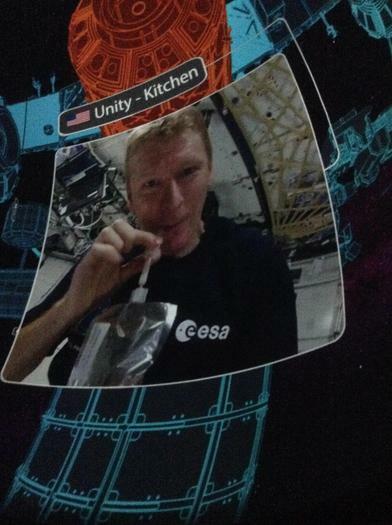 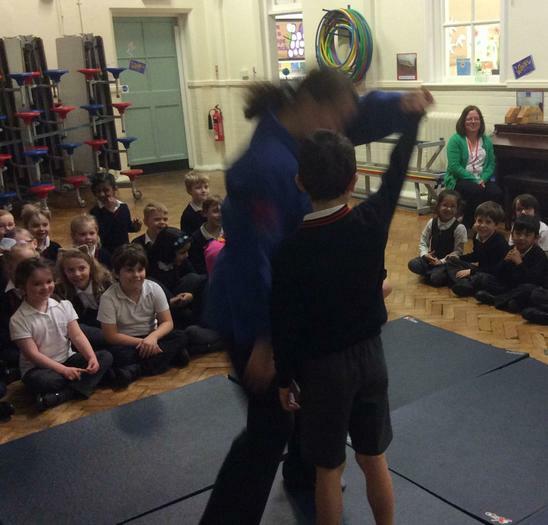 Children gained a lot of knowledge about space and the lives of astronauts, including Tim Peake. 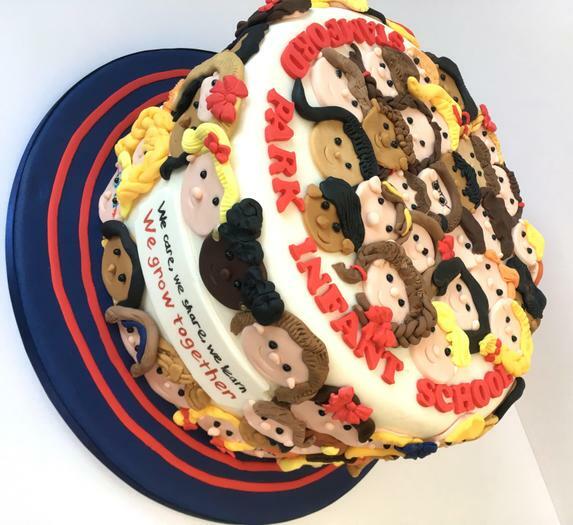 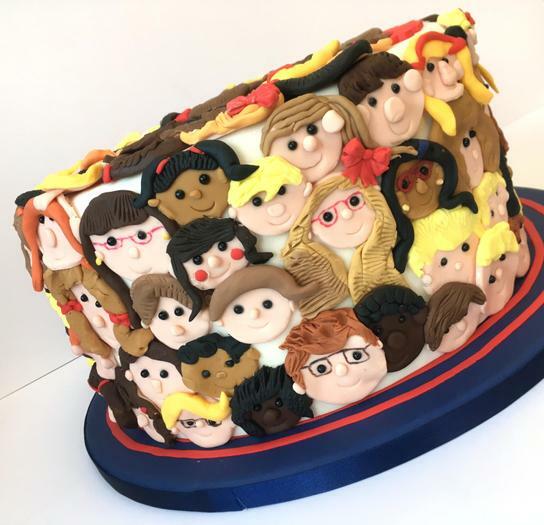 Several children had their photograph taken today with our fabulous cake and school were presented with our winner's cheque for £1000.00 from Lakeland. 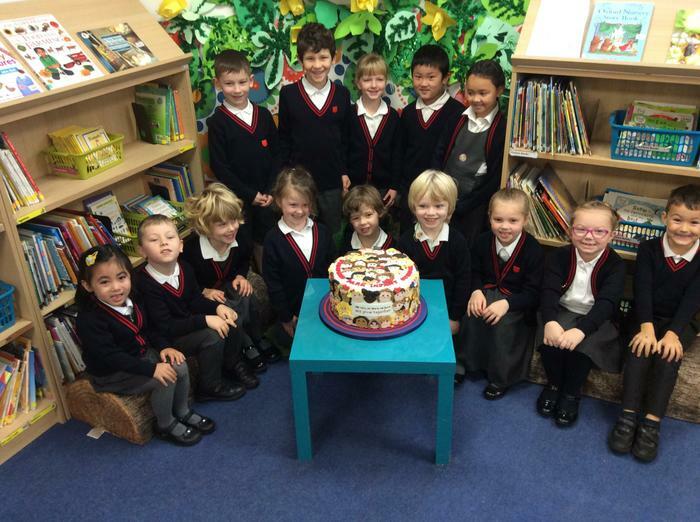 We are so proud to have won the cake decorating competition - well done everyone! 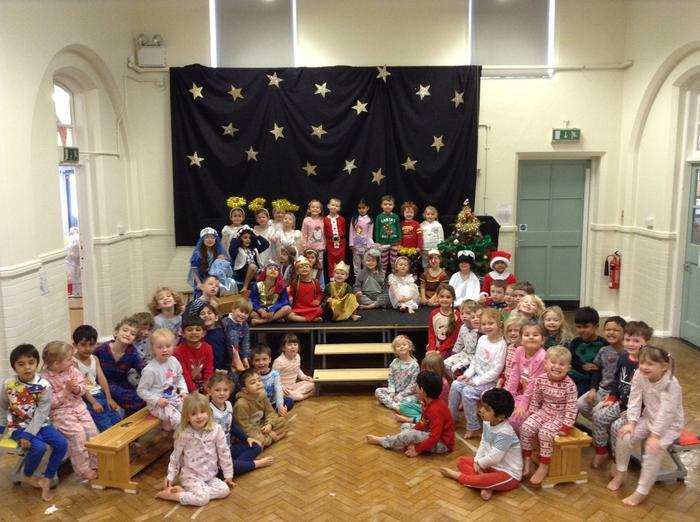 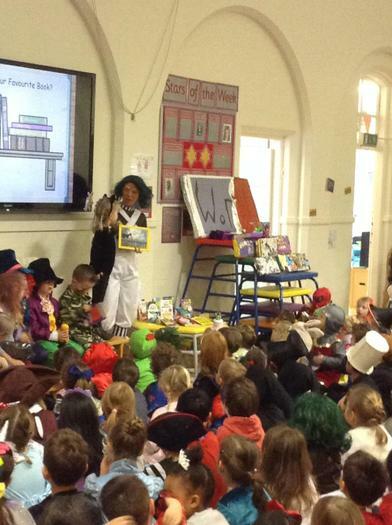 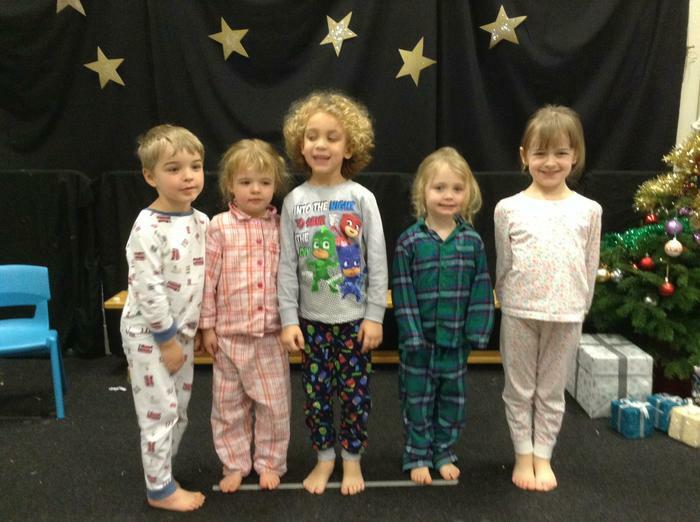 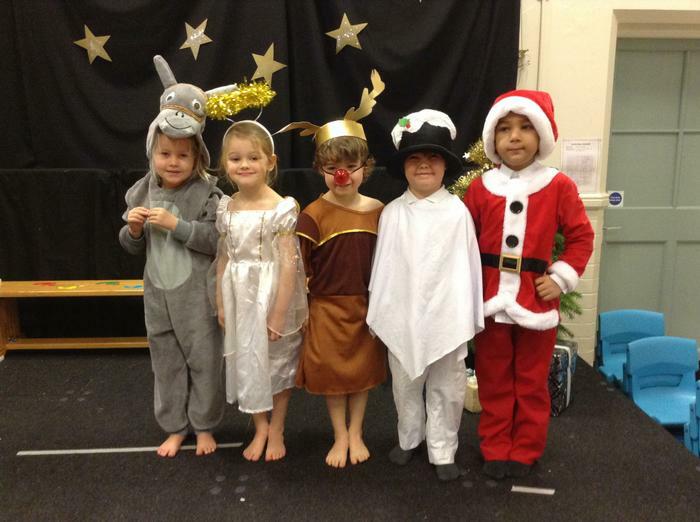 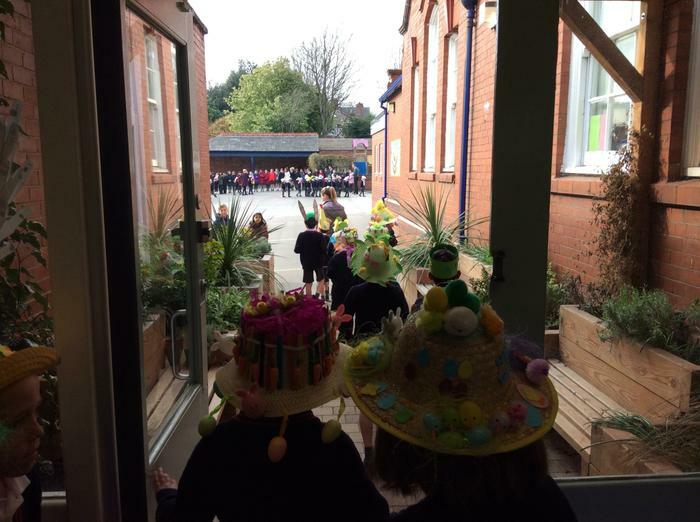 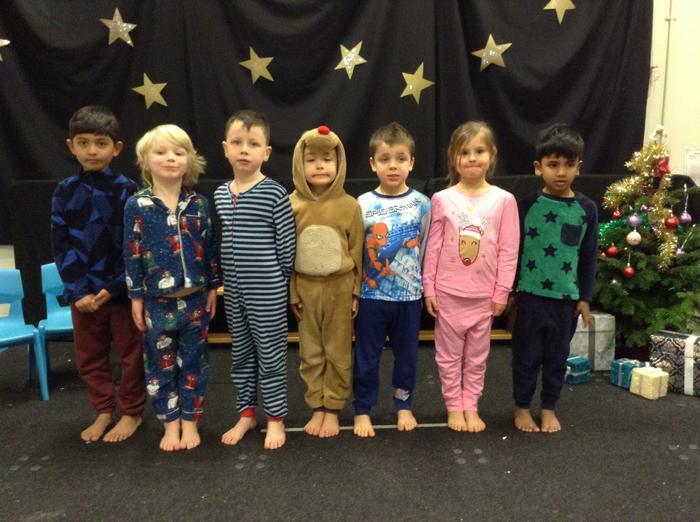 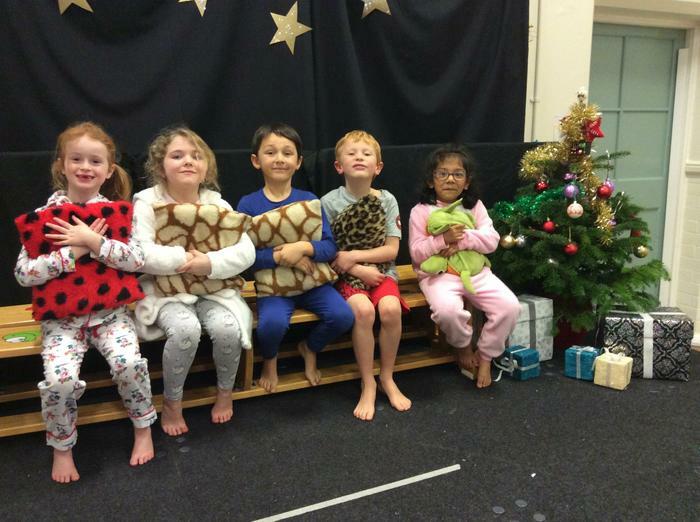 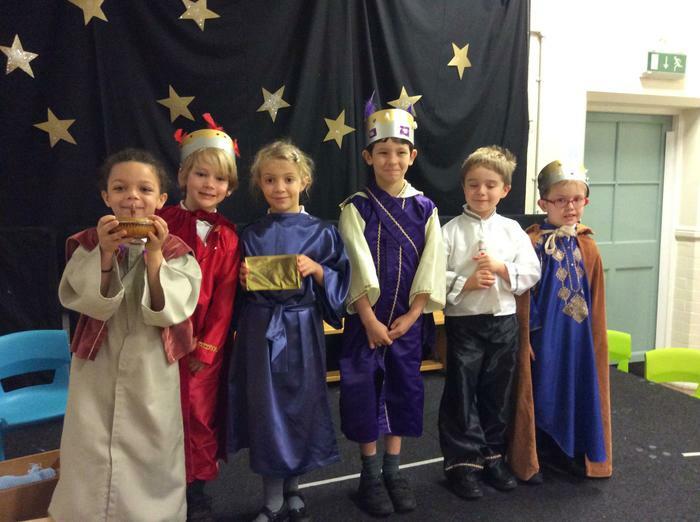 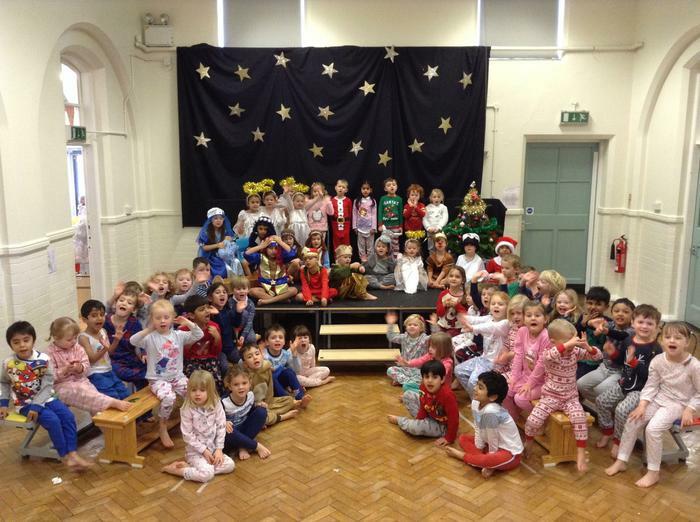 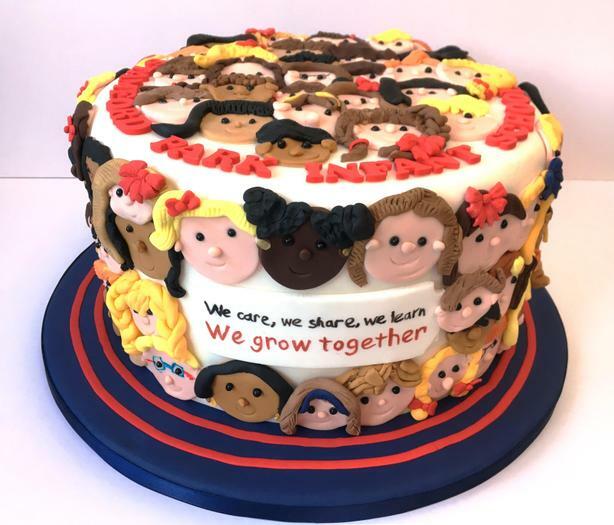 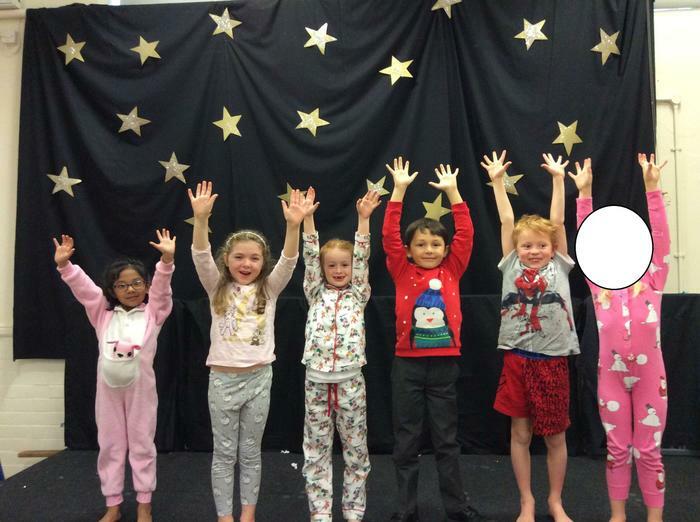 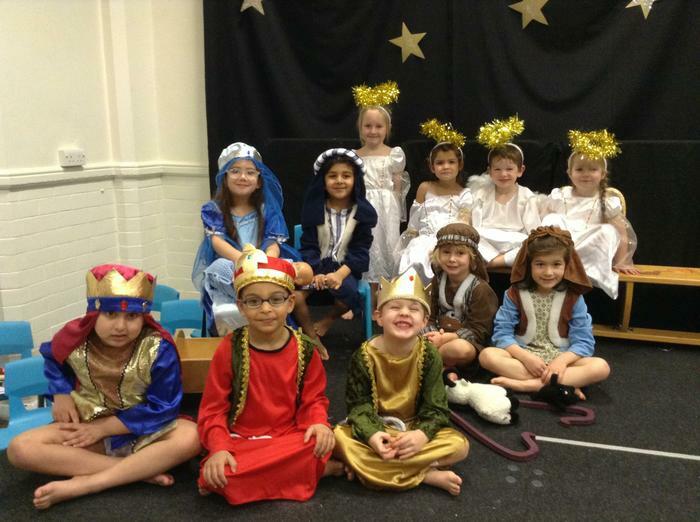 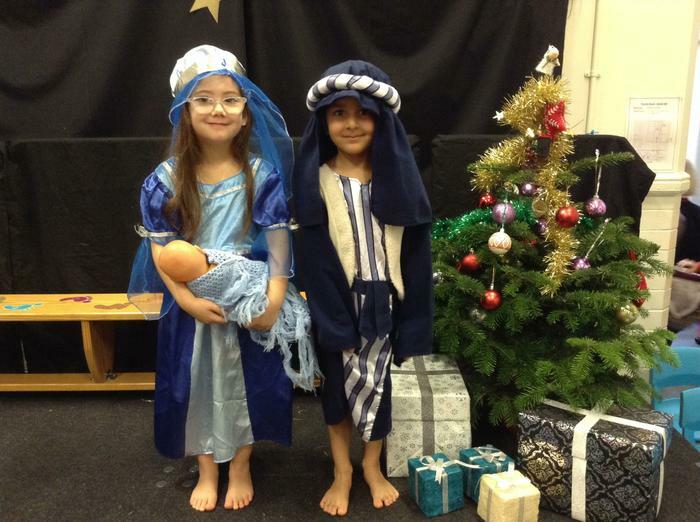 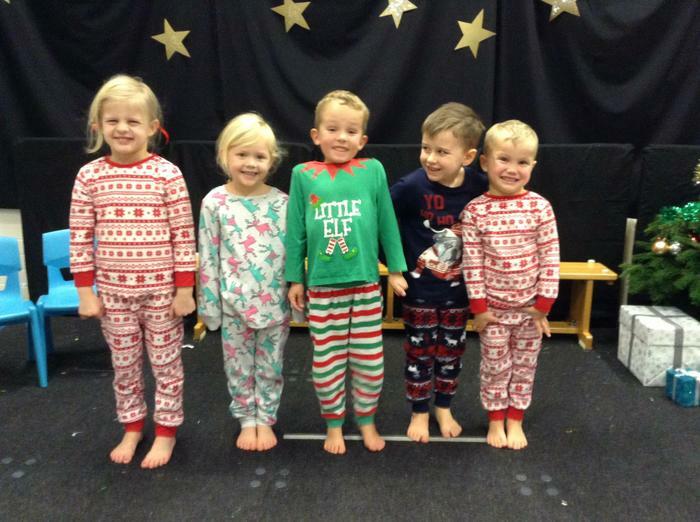 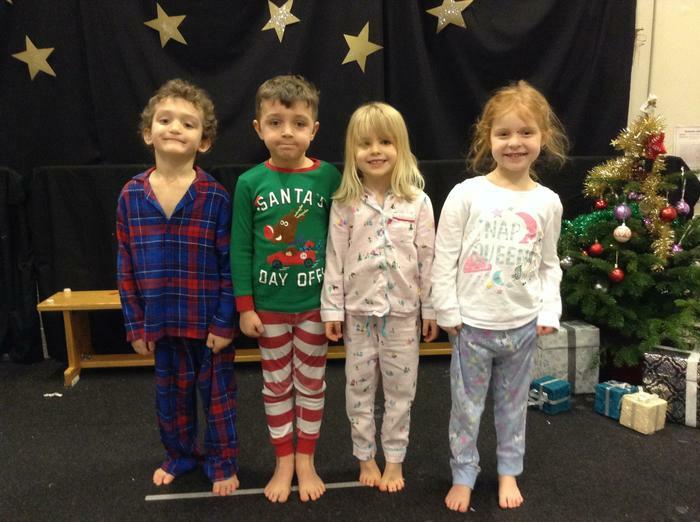 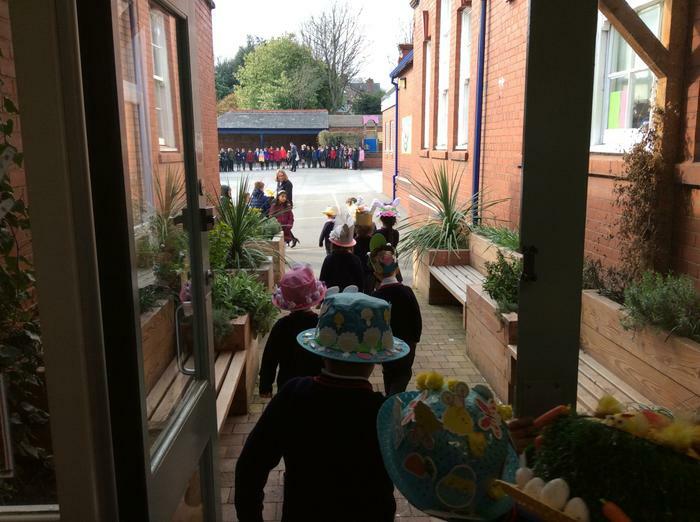 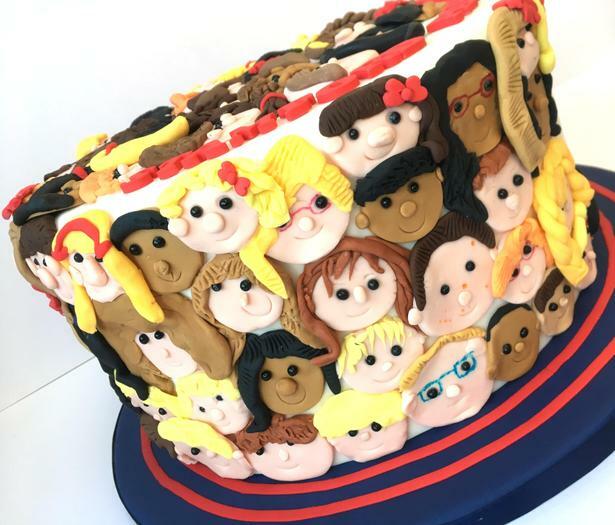 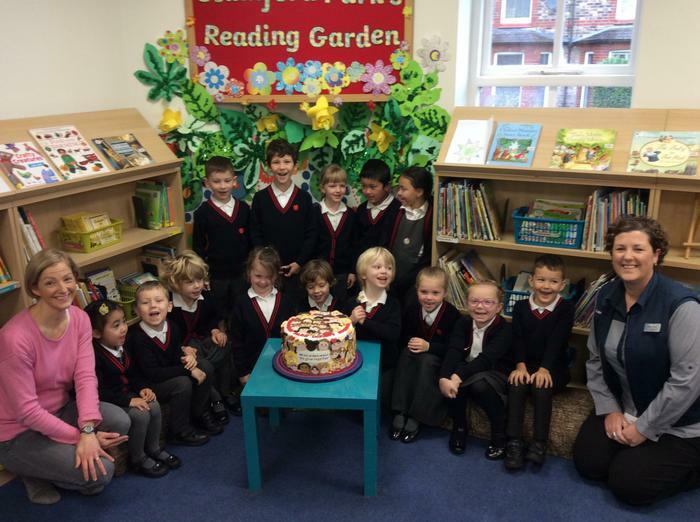 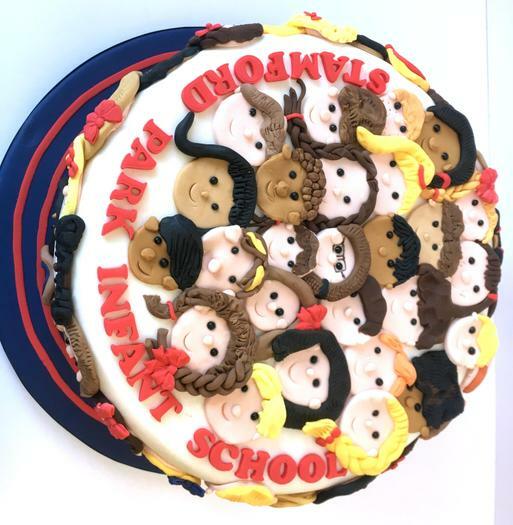 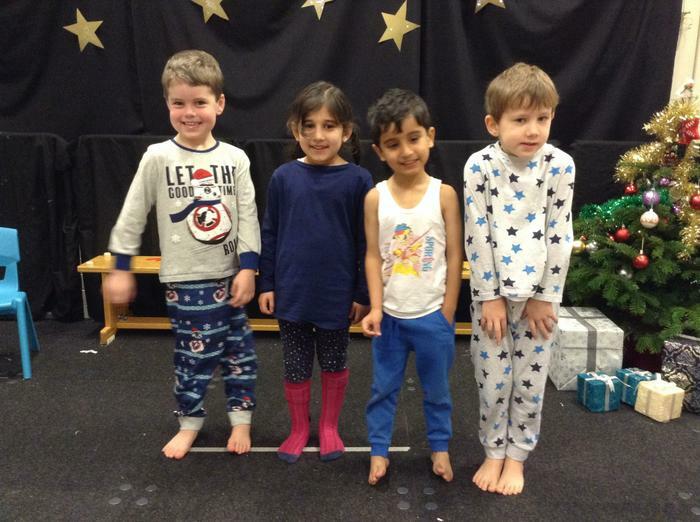 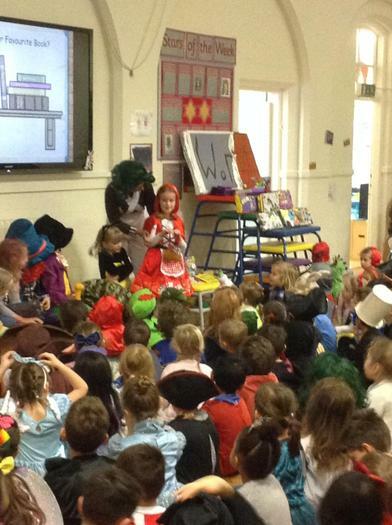 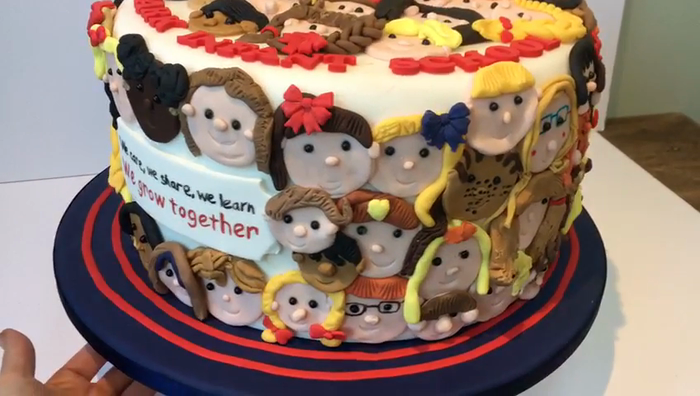 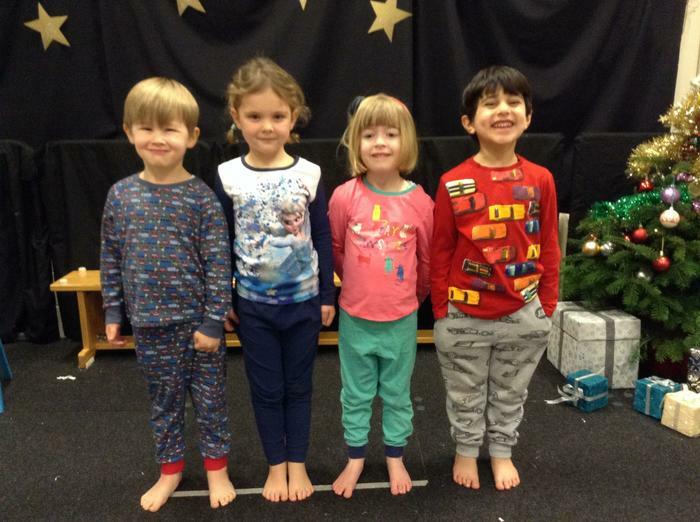 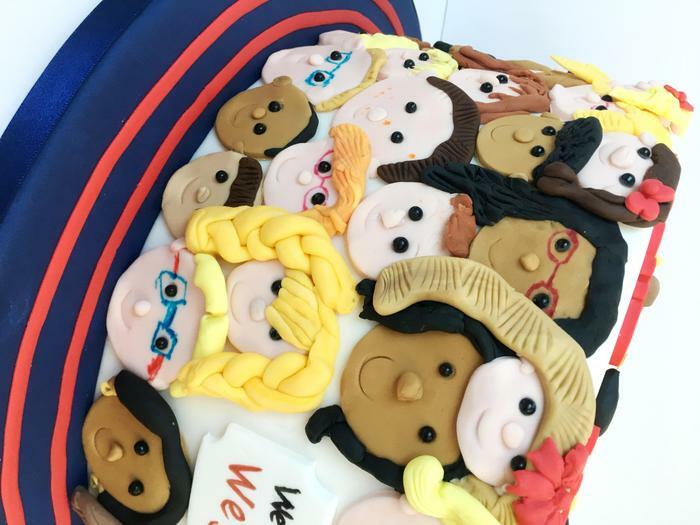 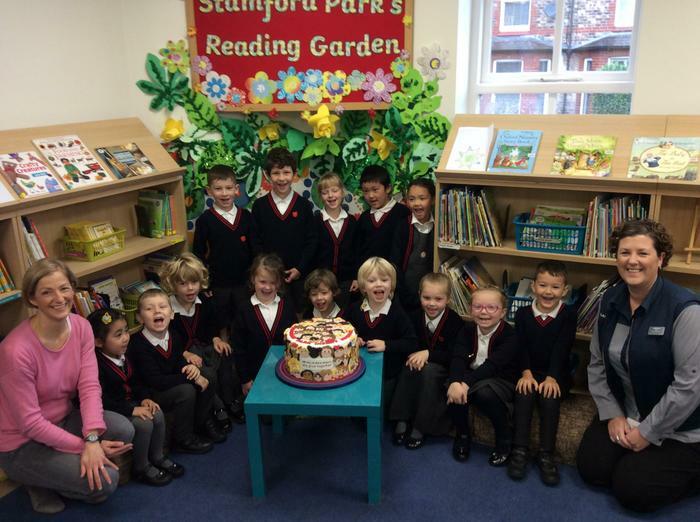 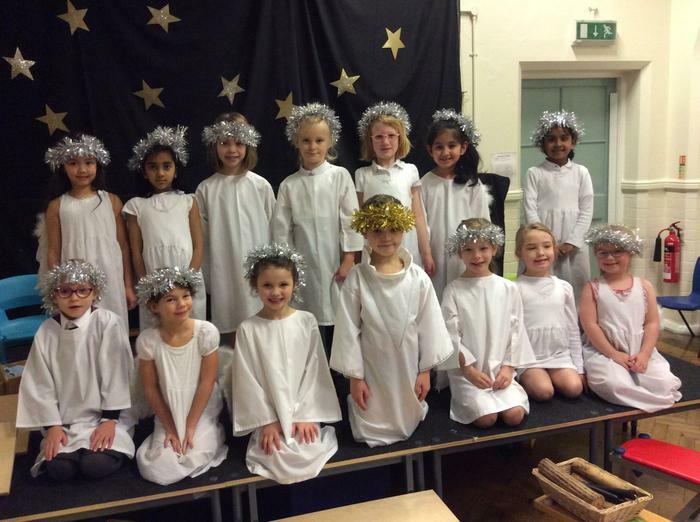 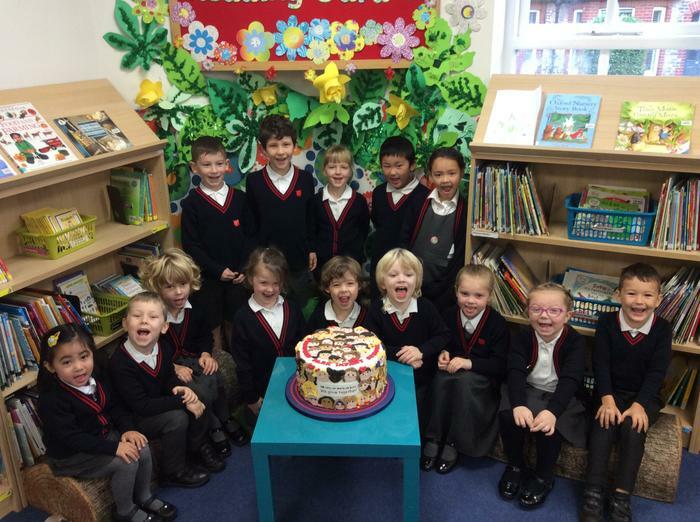 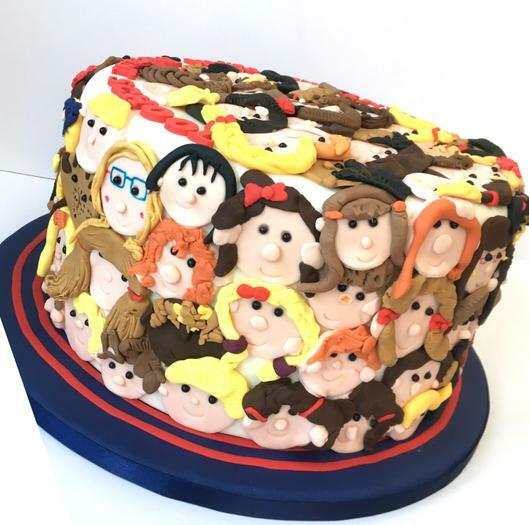 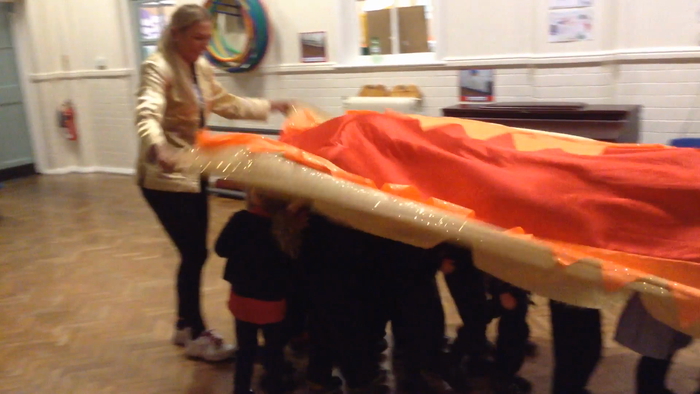 We are delighted to inform you that Stamford Park Infant School won the public’s vote for best cake. 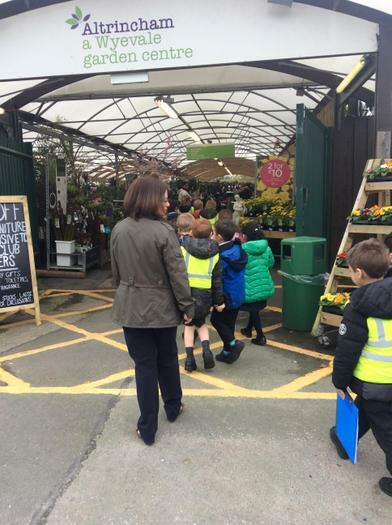 We will be presented with our prize of £1000 from Lakeland shortly – more information to follow. 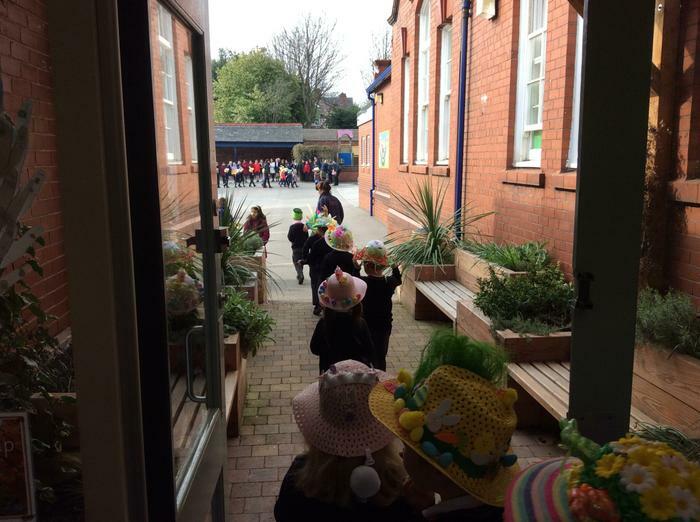 It truly was amazing and we are all delighted. 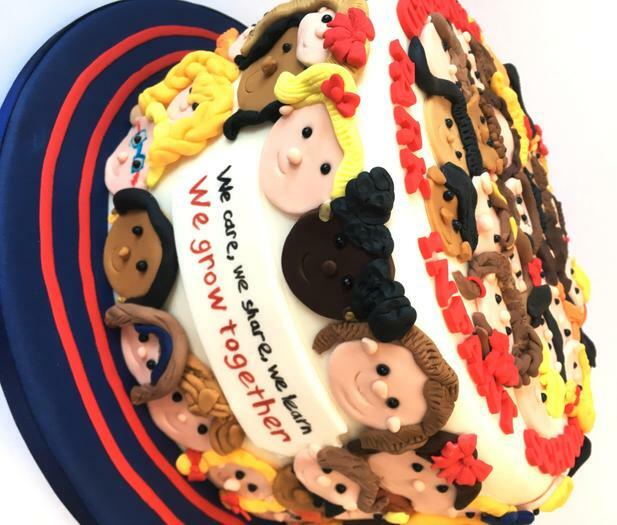 CONGRATULATIONS to everyone who contributed and worked so hard and a big thank you to everyone who took the time to go and vote for our entry! 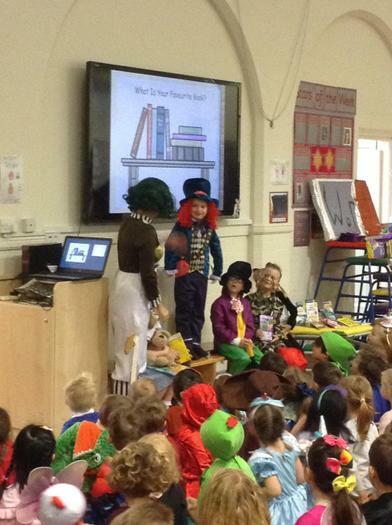 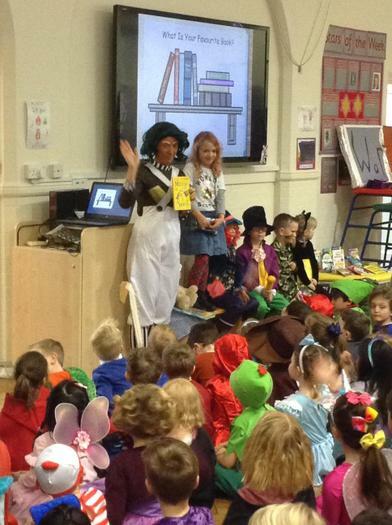 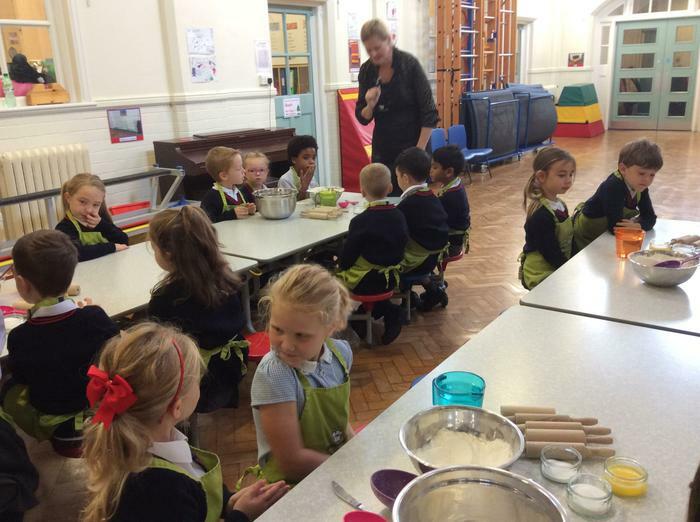 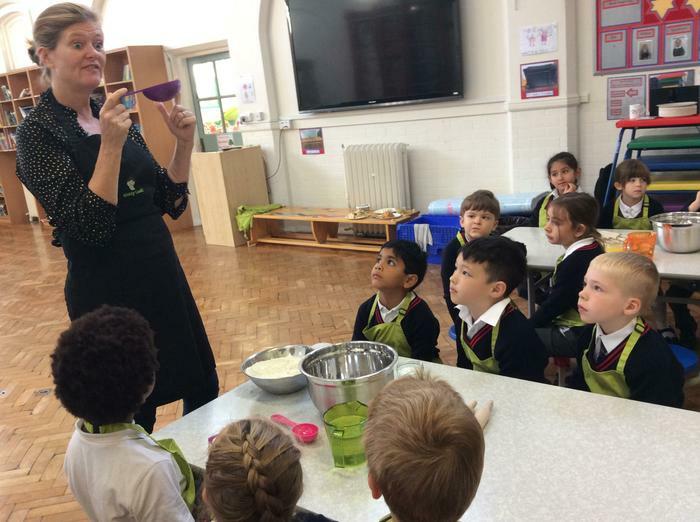 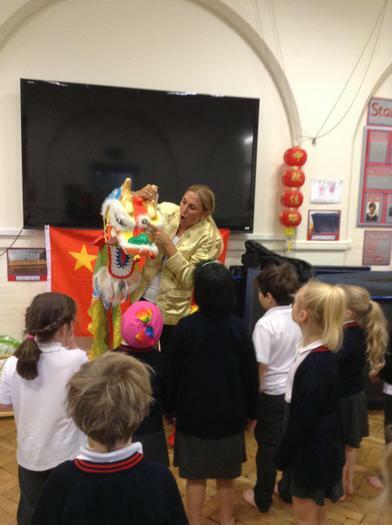 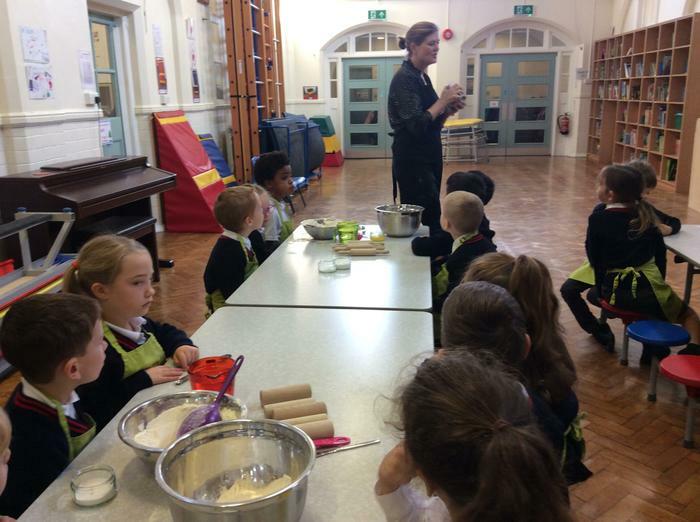 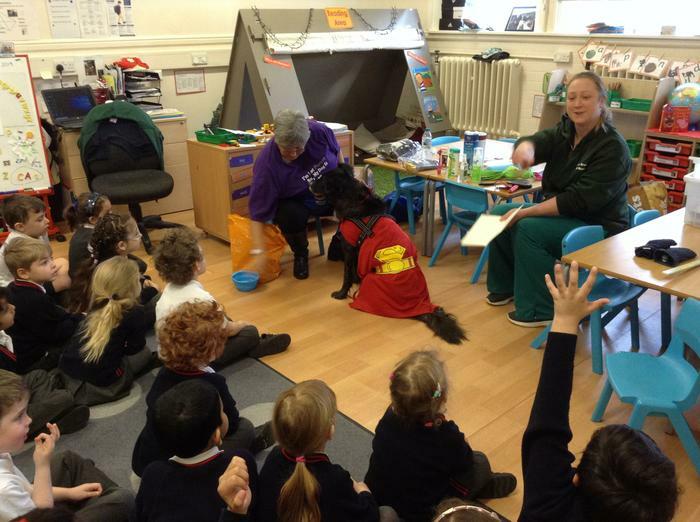 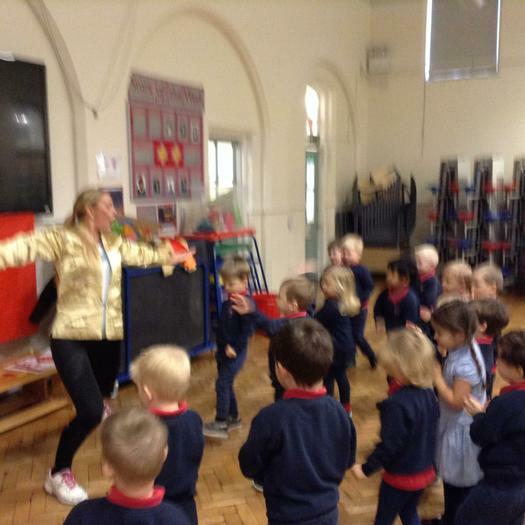 This week Year 2 enjoyed a visit from Nikki from 'Kiddy Cook'. 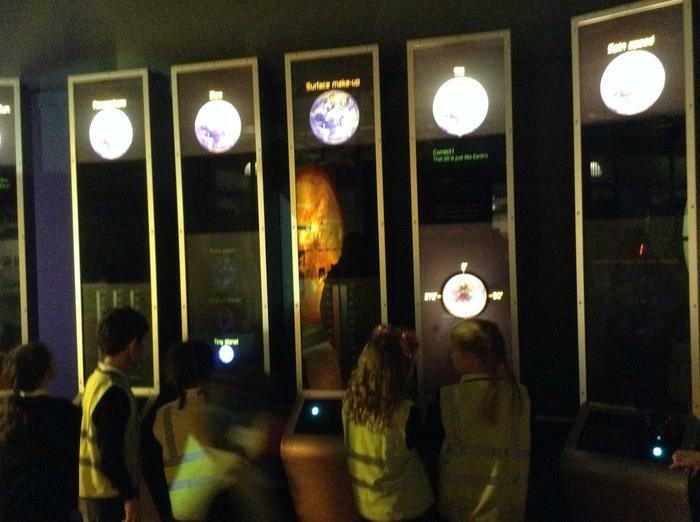 As part of our 'Where in the world are we?' 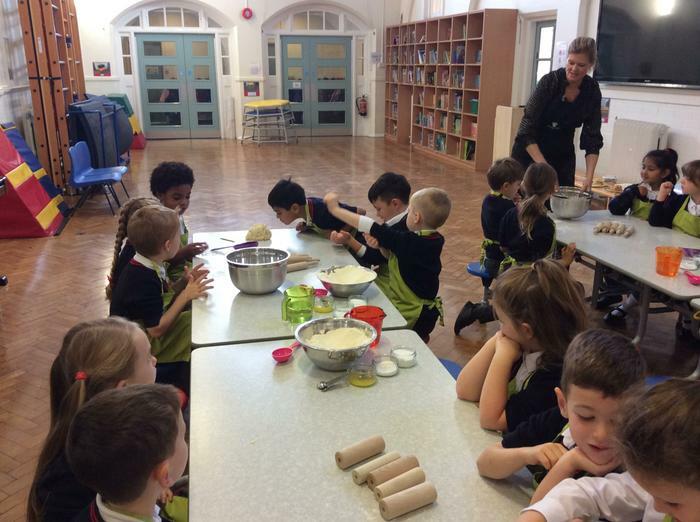 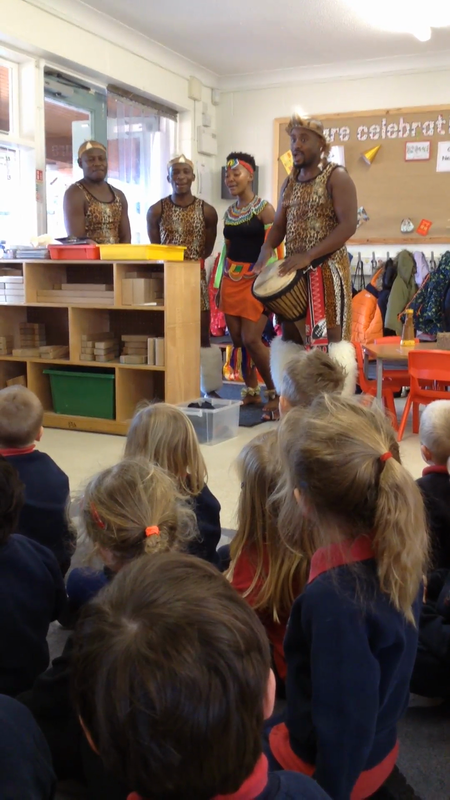 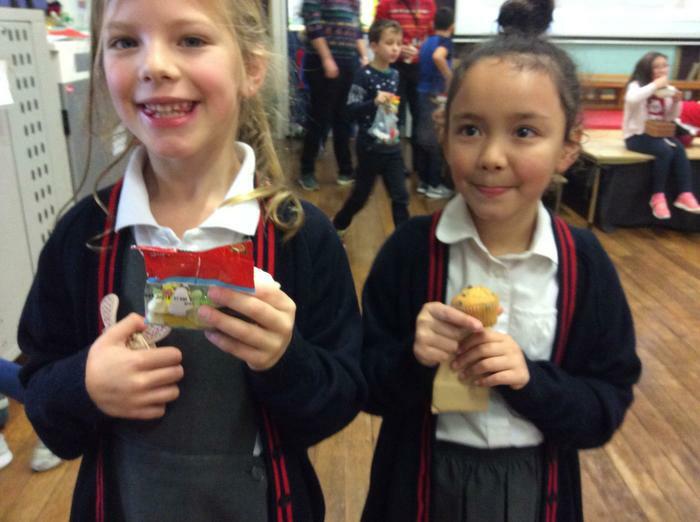 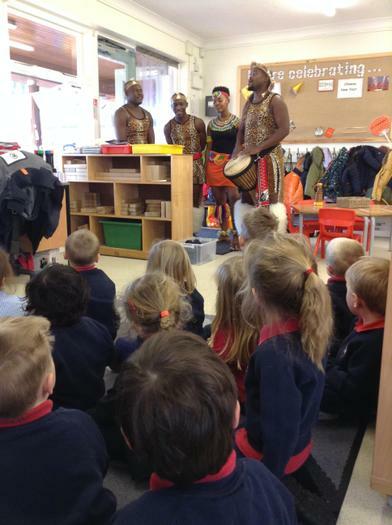 topic, the children made Kenyan flat bread and tried a variety of foods from around the world.